Hello friends! It has been a crazy last few weeks.. 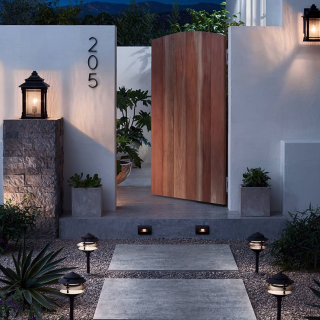 I was off in Indian Wells for the BNP Tennis tournament (more on that coming) and when I got home I hit the ground running trying to finish all the design decisions for the house. I’ve had my head down figuring this out and nary a second to blog. It’s been lights, mirrors, cabinets and more lights.. Just when I thought I was going to lose my mind, I found out Serena & Lily’s Spring Design Event starts today, March 19- 25 and everything is 20% off with code INSPO online and in store. 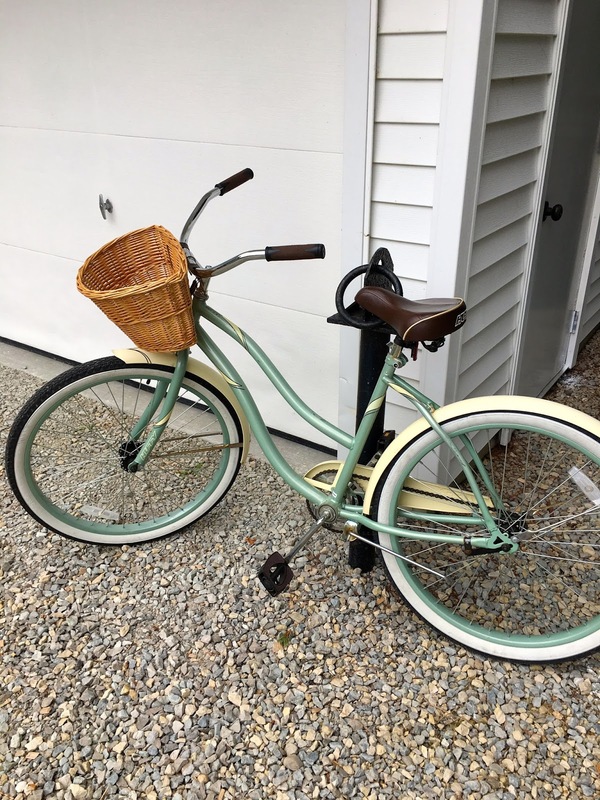 That sealed the deal for me as I had a few items in my cart for the house that I am absolutely getting this week. I thought I’d share my picks and a few other gems for you to check out from this great Northern California (Saulsalito based!) Company. 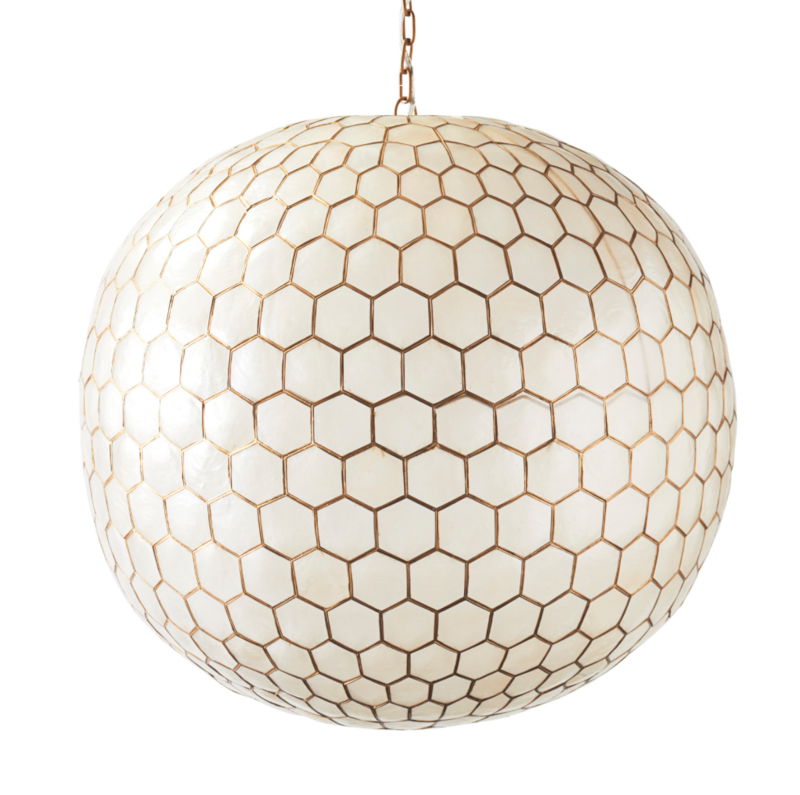 I am crazy about this Capiz Honeycomb Chandelier. To me it has just the right mix of California with a bit of disco thrown in. 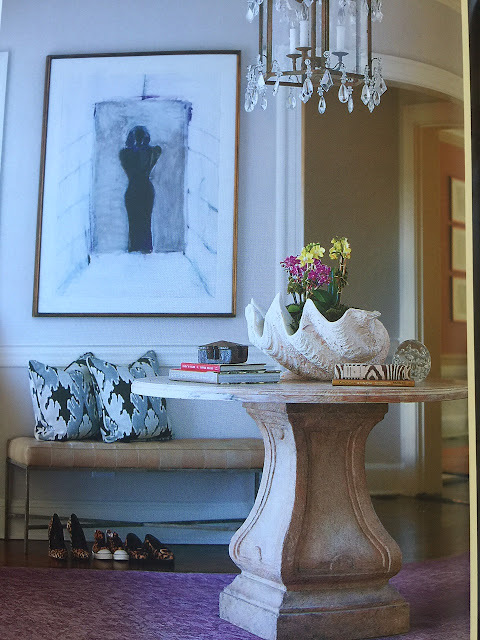 I love the mix of gold and shells and I want this in our peaked entry of the house. 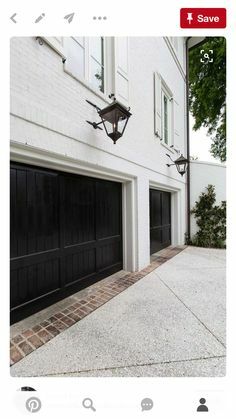 I think it will set a fun mood right away when you enter! 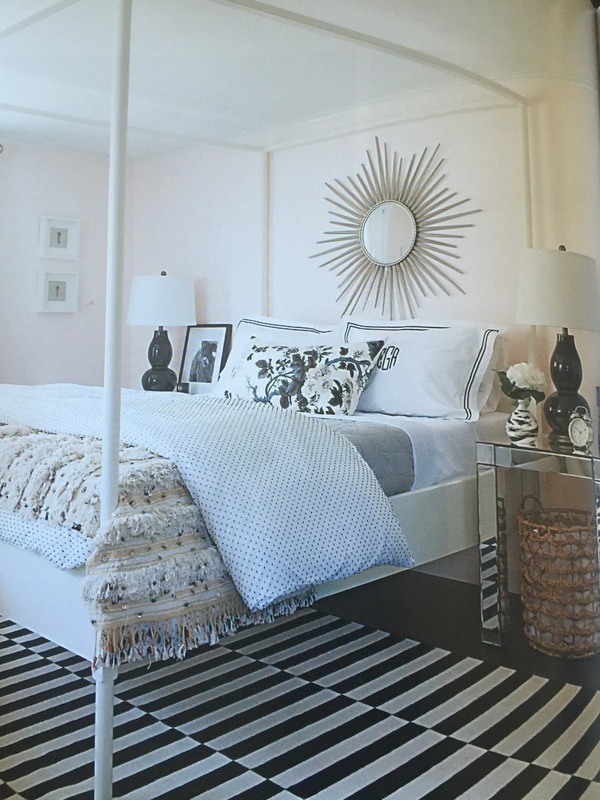 One of my other favorite Serena & Lily items has to be their Malibu Chandelier. 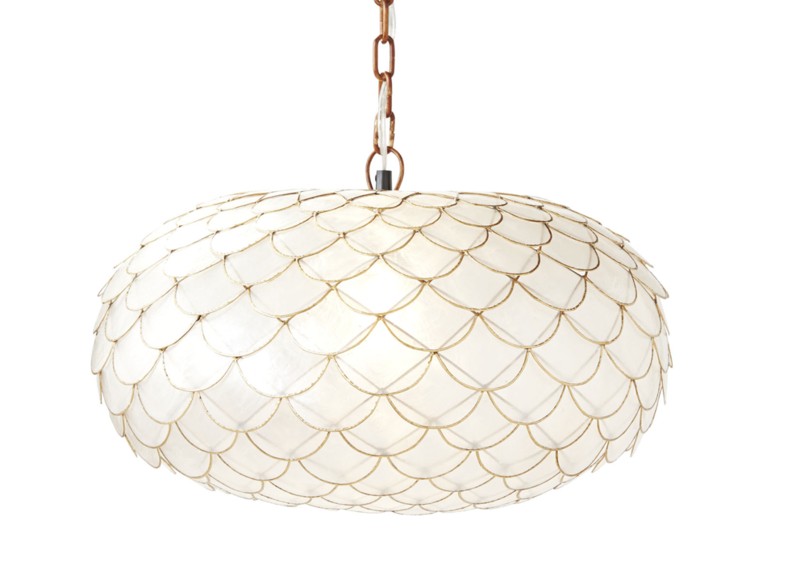 It has a beautiful look with hemp rope and the white and gold beads that have a look that makes them seem like glass. 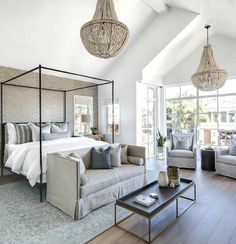 There are large and small versions of this cute fixture and I think the large above my black table and with my grey linen chairs, will continue the California vibe. 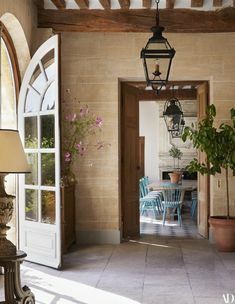 Our table is in front of an expansive French door and I think the chandelier will be nicely spotlighted there. 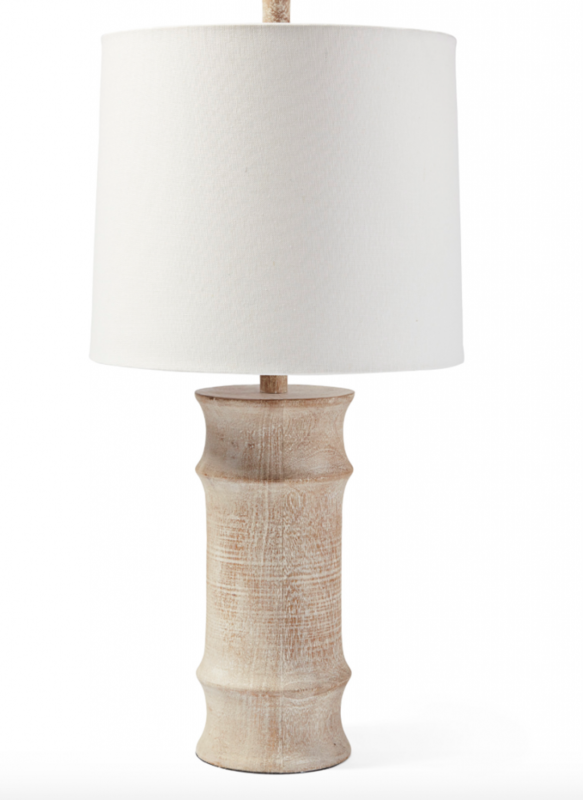 Also on my list is this smaller version of the Capiz light in scalloped version which would be super in a bedroom or bath. Other great deals to check out.. These Balboa Counter Stools in the pretty Mist color.. 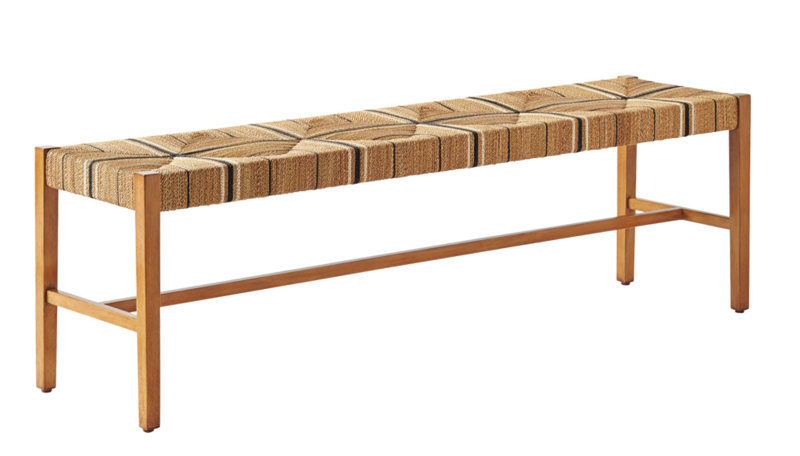 This Carson Bench would be darling in an entry or at the foot of a bed! 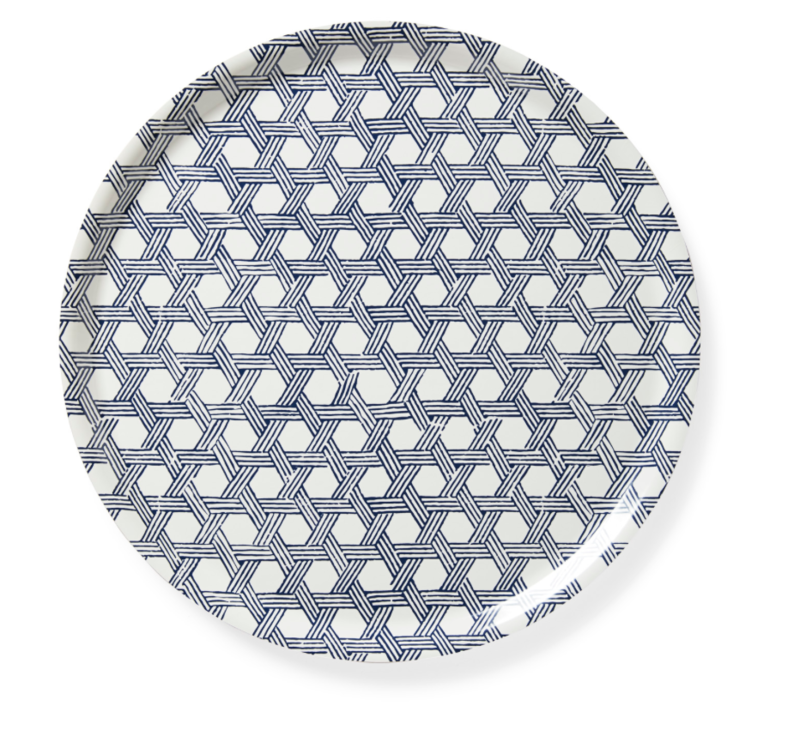 Fun for spring and summer entertaining is this Cayman Round Tray..
I’d love to use these Brela napkins for a poolside dinner I hope I will be sometime soon. 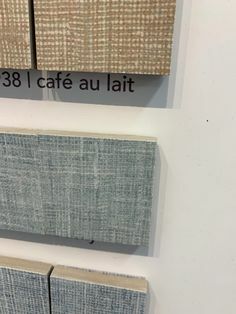 Serena’s gorgeous Grasscloth Wallpaper is also something I want to do and the colors are lovely, especially this cactus which I could see in a bedroom or powder room or a hallway..
And the Halsey Table Lamp..I love the Hawaiian feel of it. 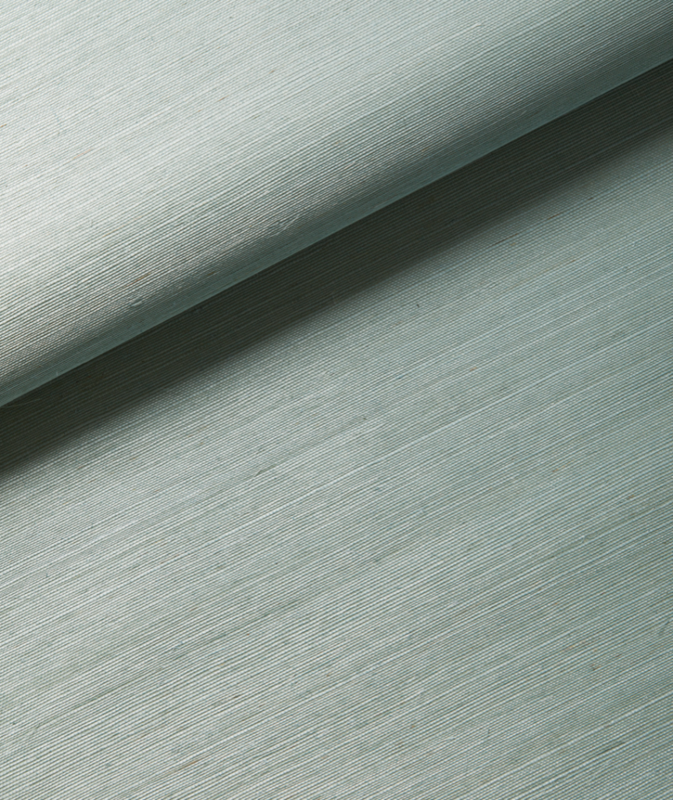 I am also mad for the Blake Raffia Console Table, which comes in a pretty grey and a natural as well as this blue. Perfect for your entry with a mirror and I do love it as shown here as a bedside table. 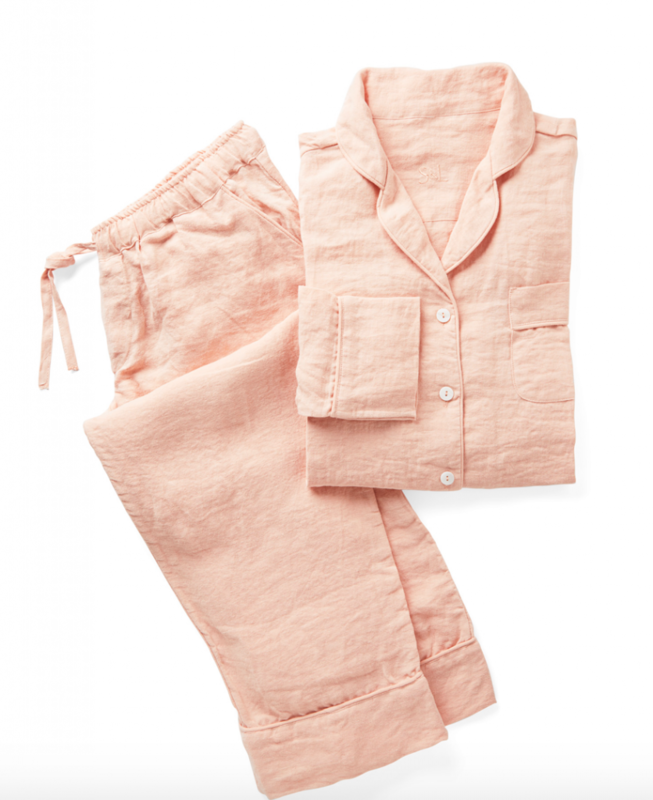 The Positano Linen Pjs in Wild Rose are in my basket too. More of everything lovely on the full Serena & Lily site here. Don’t forget to use the INSPO code and the sale goes until Monday the 25th. How was your week? 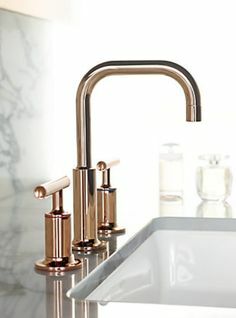 I am just completely overwhelmed with house stuff like looking at tile, faucets and trying to get my house plan STILL approved by the city I live in. It’s been extremely worrying and stressful, and stomachache inducing as we are paying rent at the rental and building hasn’t even begun. I’ve finally nailed down my bath tiles and floors. 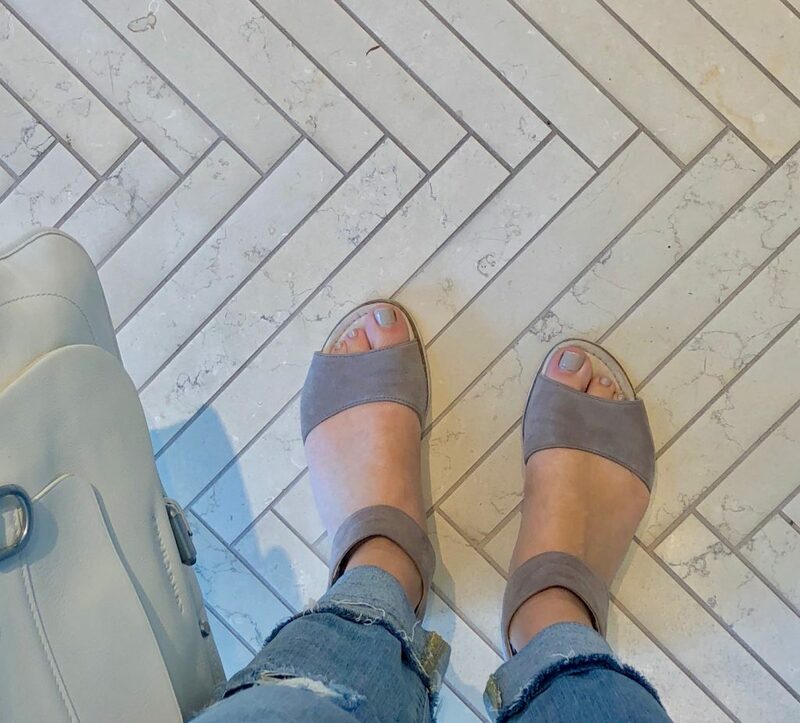 A peek of some of it here.. and my dying feet at the tile store- don’t you love that herringbone set tile? 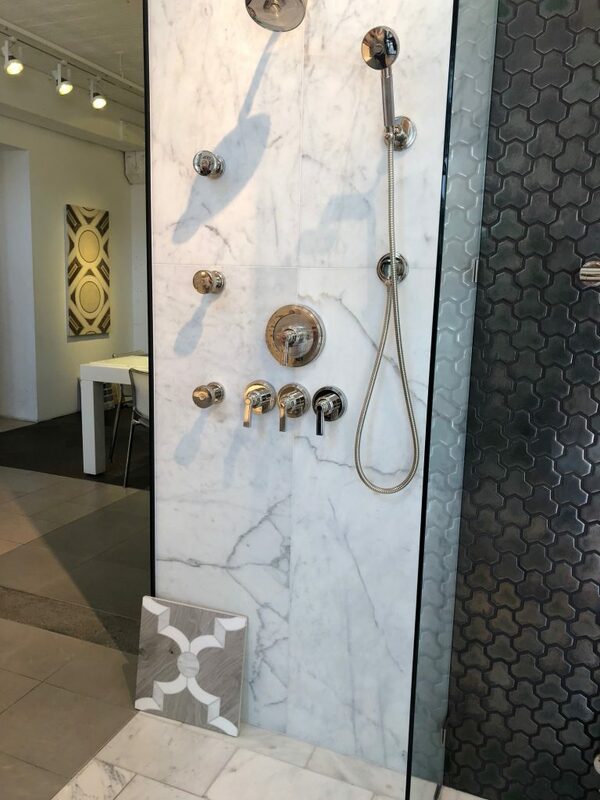 A few pics from the Ann Sacks showroom in San Francisco. I love the tile on the floor with the marble- maybe for my master. 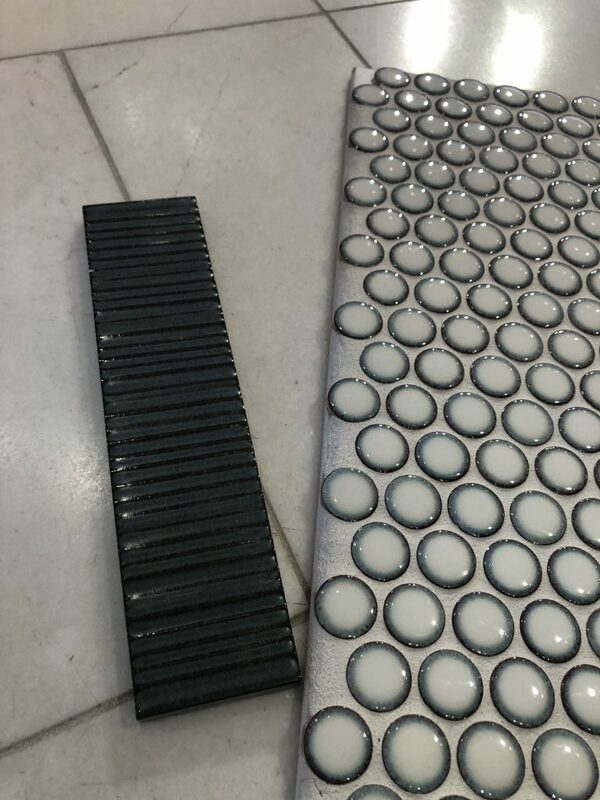 For the boys I am thinking a combo of grey, off white tiles and some dark denim blue colored accents like these cute tiles for their shower floor and in the shampoo niche or in a stripe going around the shower. It’s hard to see the true blue colors in a photo. On the bright side, our rental is larger than my own house and my landlords are the kindest, sweetest people who I adore. They were so cute and came to get some mail and I invited them in. They were very kind and their daughter and granddaughter said they love my way of decorating. I was surprised as I have such a crazy mix here, but I guess together it all works. They made my day and were so sweet. I am what is described as a nester. I am happiest at home and wherever I am, I have to make it my own. A lot of people say they would do nothing to a temporary rental, but I would find it hard to live here without making it mine in some way. 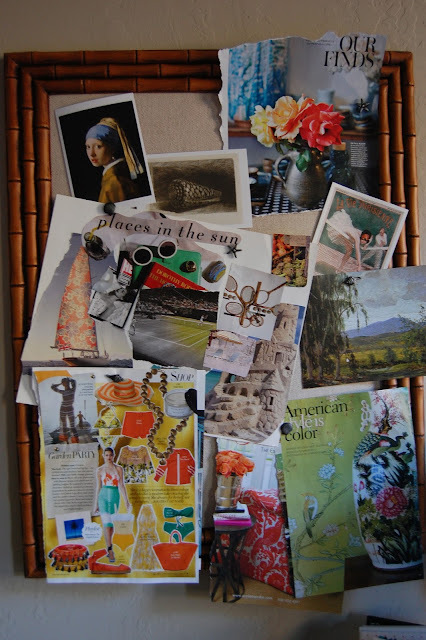 What they liked was my colors in my bedroom, quirky colored handbags as placed about, and some pops of color with white. They have a wonderful trough planter under the desk window and I replanted it with little flowers, so the white and pops of color kind of worked well! Sorry for the messy bed. 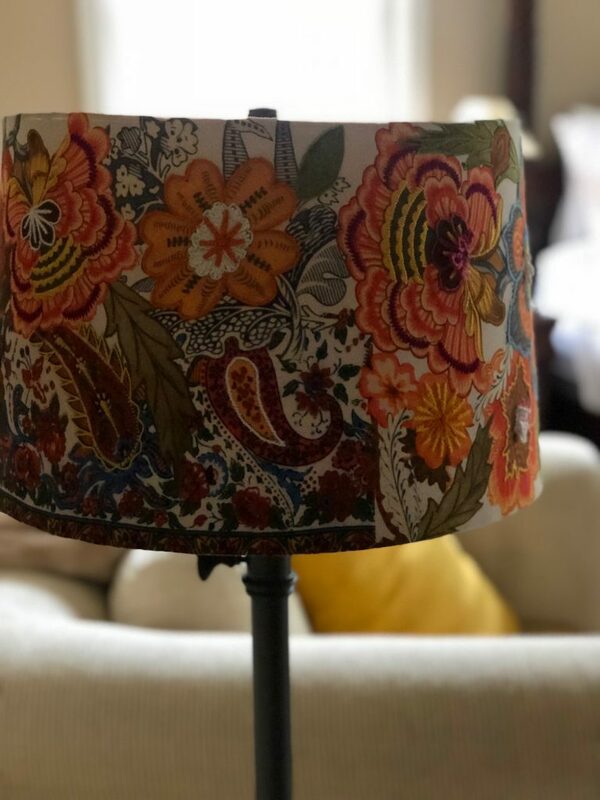 I love these lampshades I found at Homegoods again. 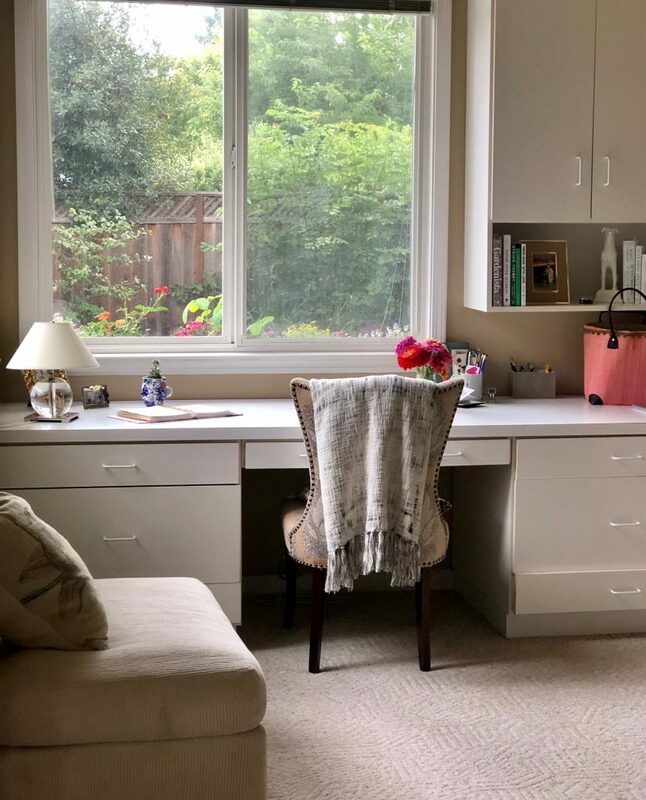 Love, love, love this desk and the view. 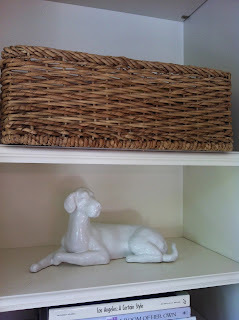 I use my baskets (This from the French Basketeer,) as filing areas of a sort. 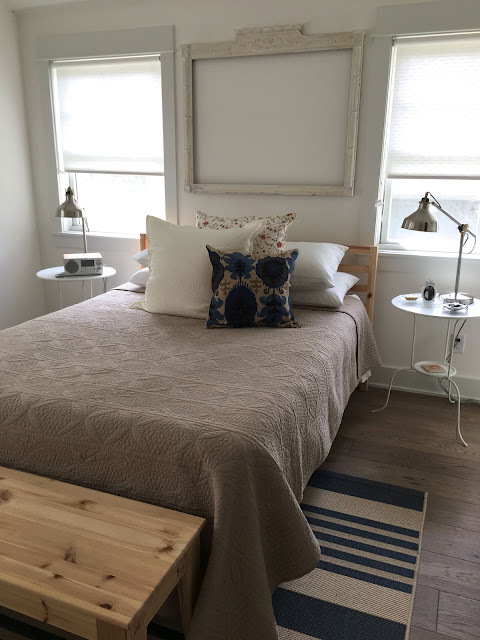 There is a good mix of blue, natural woods and rugs and throws here. I’m a bit of a throw ho.. Sorry I couldn’t resist- but they do easily add color and fun to the home and spice up things. 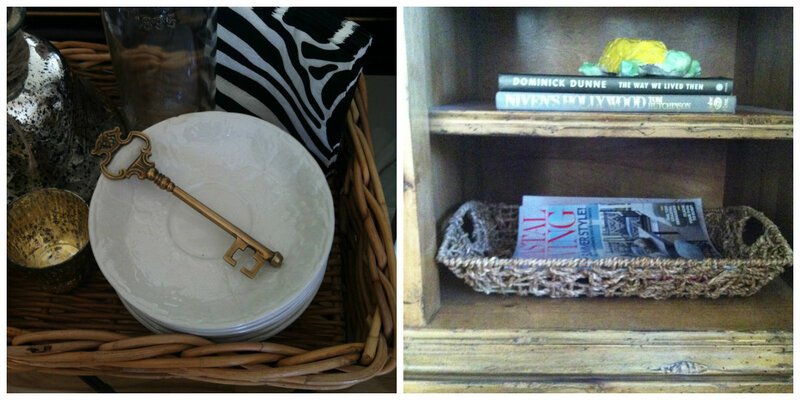 I’ve also found some nice accents at a local chain called Harvest I adore. 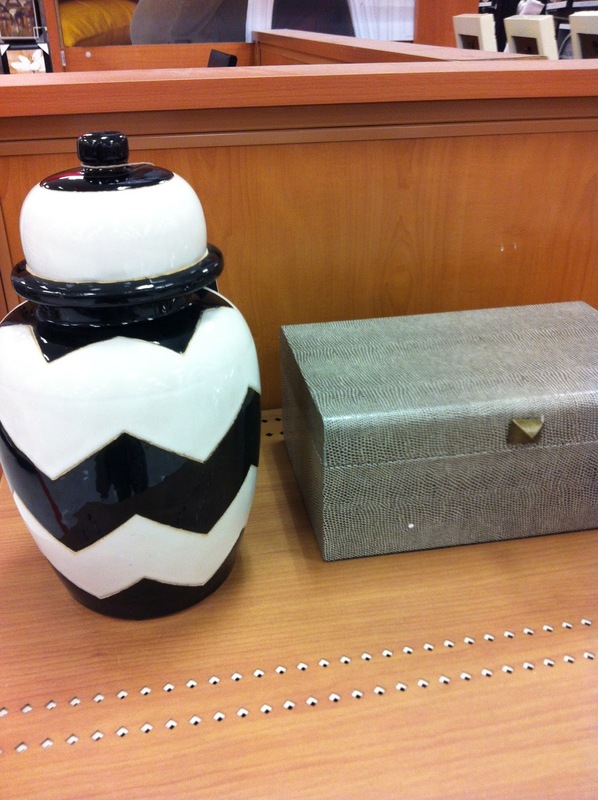 I like plain furnishings, so I can change things up with the seasons and frankly when I get sick of looking at things. 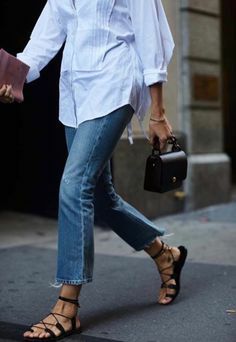 I think visual people are that way and if you are someone like that, it’s best to stick with a lot of white, solids and blacks. You have a lot of choices when you do. 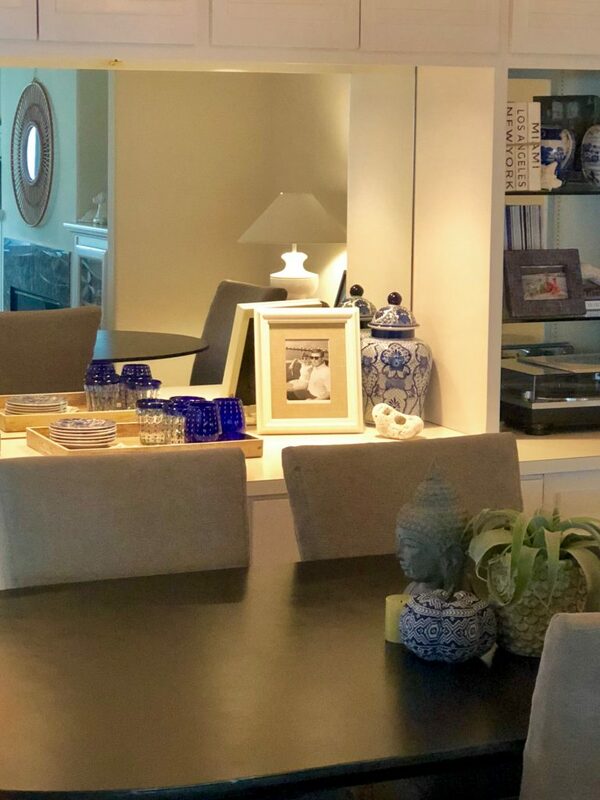 It’s been summer, so I’ve had all my blue out and in this rental I was lucky to have a wonderful spot to display some of my blue books, glasses, plates and vases with a mix of coral we have from vacations over the years. How awesome is this built in? It fit my record player and I created a nice wrap station too in one of the drawers for the upcoming holidays. 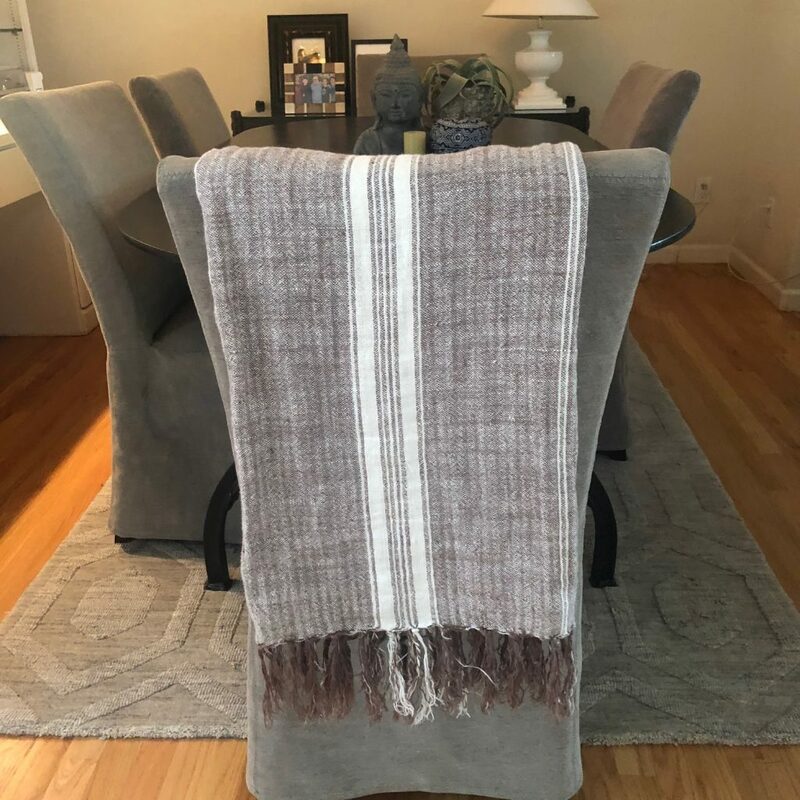 This cute throw is from the Los Gatos Harvest store. Now that fall has begun I have had my thoughts on home ideas for my renovation and finding inspiration. 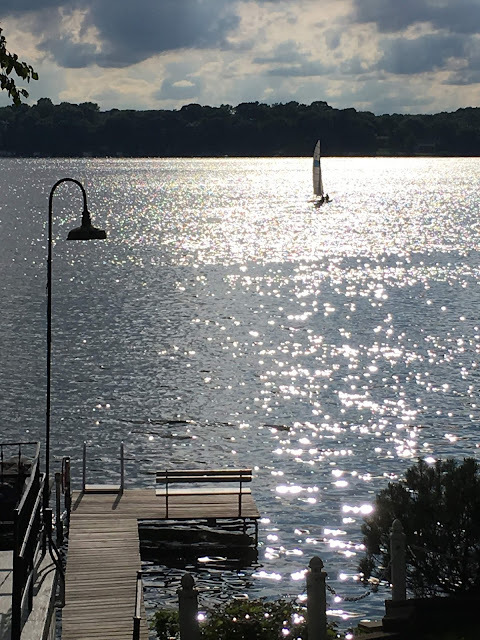 I was lucky to catch up with my cool friend Bonnie over lunch who spent the summer at her lake house she renovated in Lake Mills, Wisconsin. 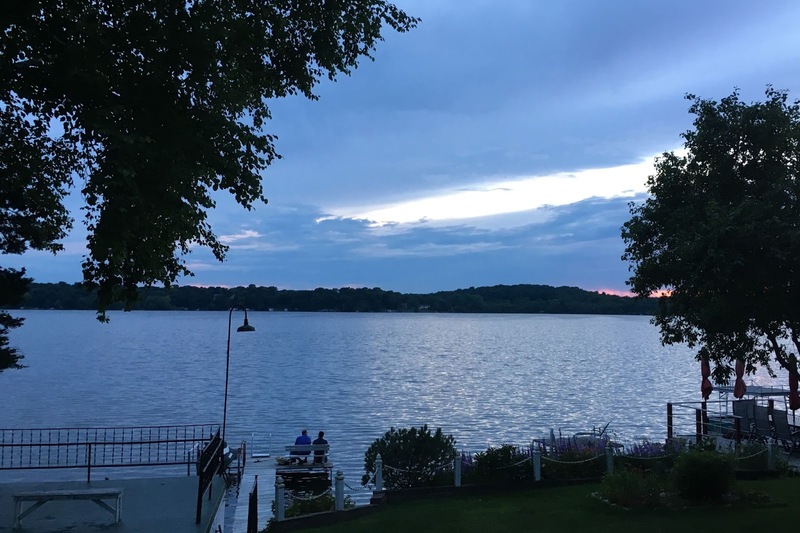 Since 1929, five generations of her family have owned homes on this lake and they all love spending time there together. I loved hearing all the relaxing days spent on the lake and things like paddle boarding, sunset cruises, family cribbage competitions and Friday night fish fries that are unique to Wisconsin lake living. 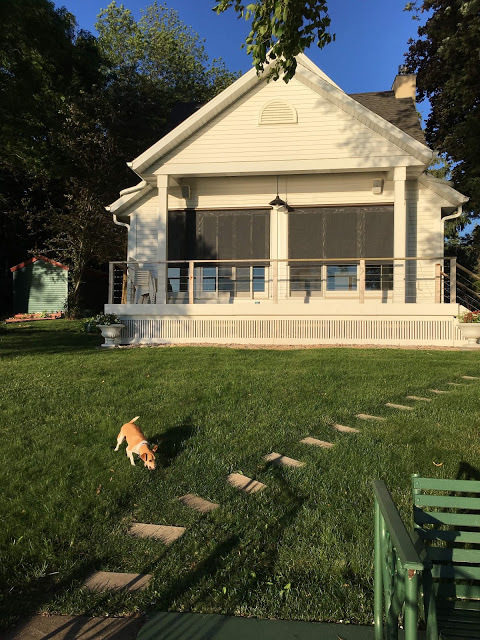 Bonnie is a artist and a local mom who has a great eye for design and I flipped when I saw how pretty her lake home is! Bonnie’s mom and brother own homes on this lake and when the opportunity came to buy one of her own she grabbed it. 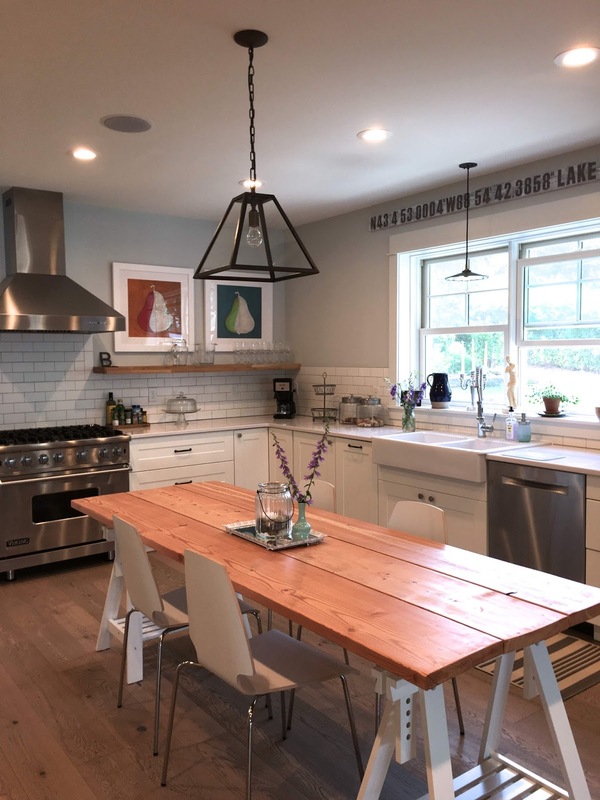 Bonnie and her husband Dean worked with a local design and build contractor spending one full year redesigning and renovating every inch of the house. The house design focuses on the west facing beauty of the natural views and the peace and serenity drawn from the water. Being an artist as well as super creative, it has been a design lab of sorts for Bonnie. What is so inspiring is that Bonnie used finds from thrifting along with a few newly bought things to pull it all together. 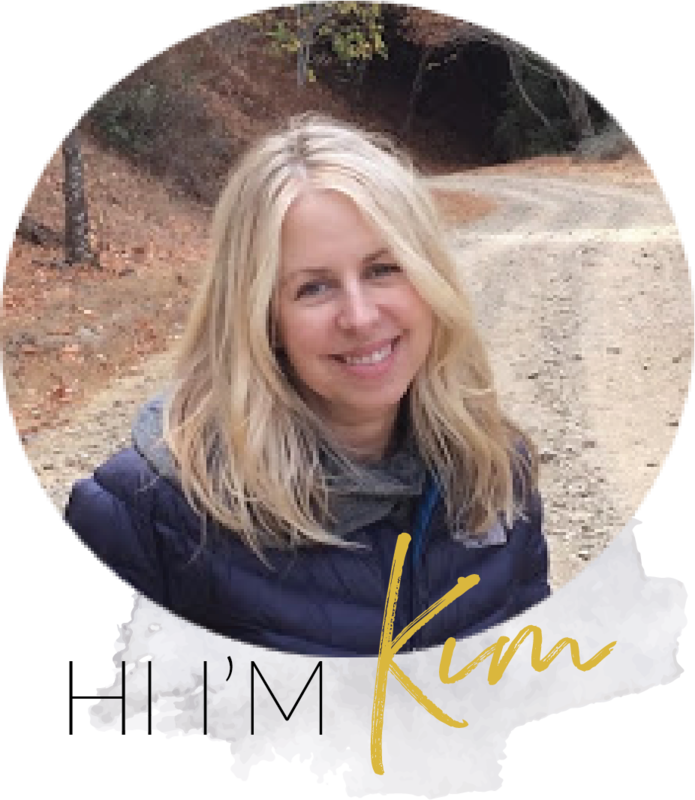 She has a way of finding treasures and putting her own tweaks on them. I was so charmed by what she has done I asked if I could share some photos along with stories of what she’s done on the blog and she kindly agreed. 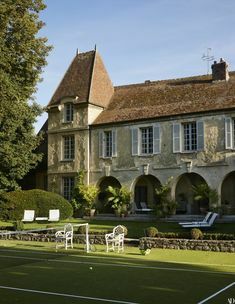 How fun would it be to have such a spot to get away to and put your own spin on? I’ve included some of Bonnie’s own words here telling how she did it. Enjoy! 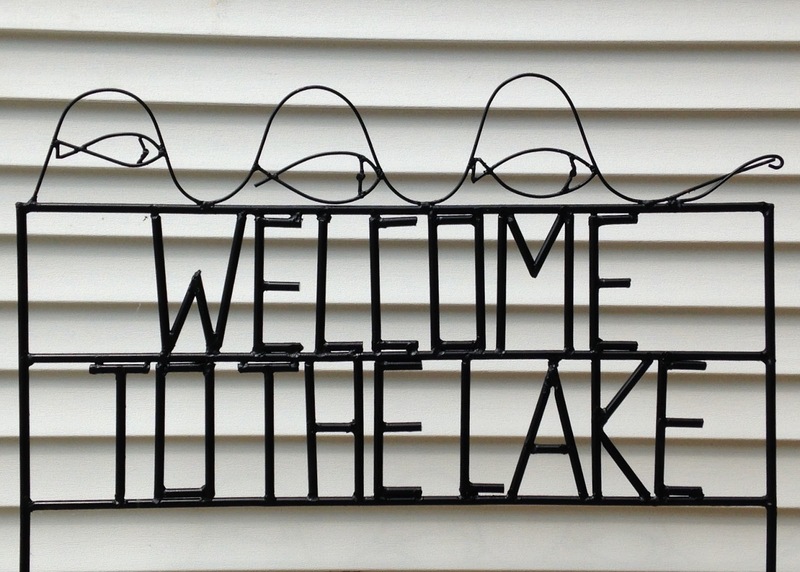 This wrought iron sign was made by Bonnie’s father-in-law for them! Just look at that gorgeous sunset! I like the open feel of this home. Bonnie’s art in her kitchen. 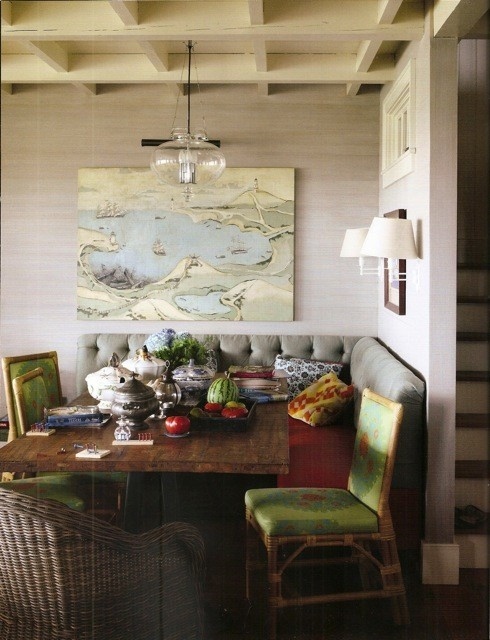 I love her light palette with blues in this waterside home. 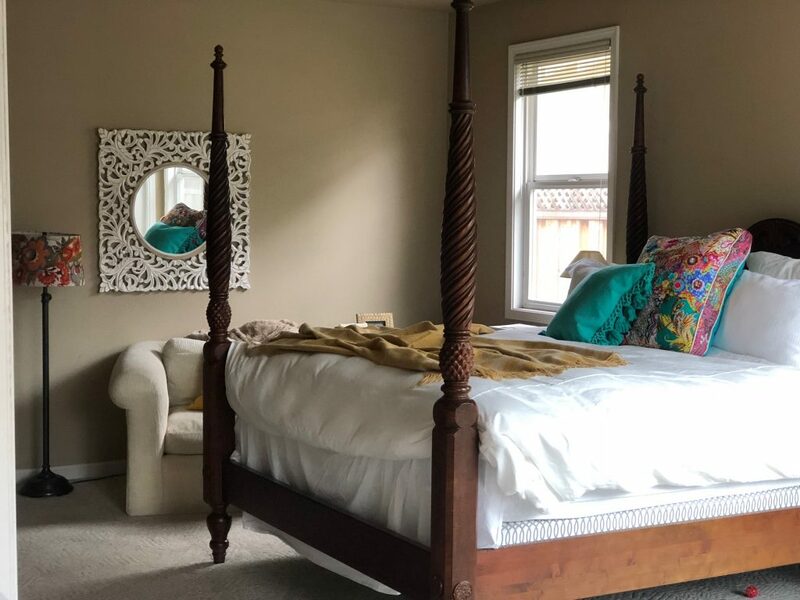 A gorgeous old frame is its own art above the bed. 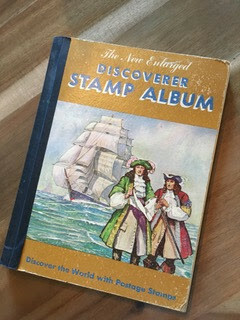 ‘Dean had a stamp collector’s book when he was little. His parents gave me the book when we were first married in 1983. The book has been carried around to 8 different houses in five different cities over the past 34 years. 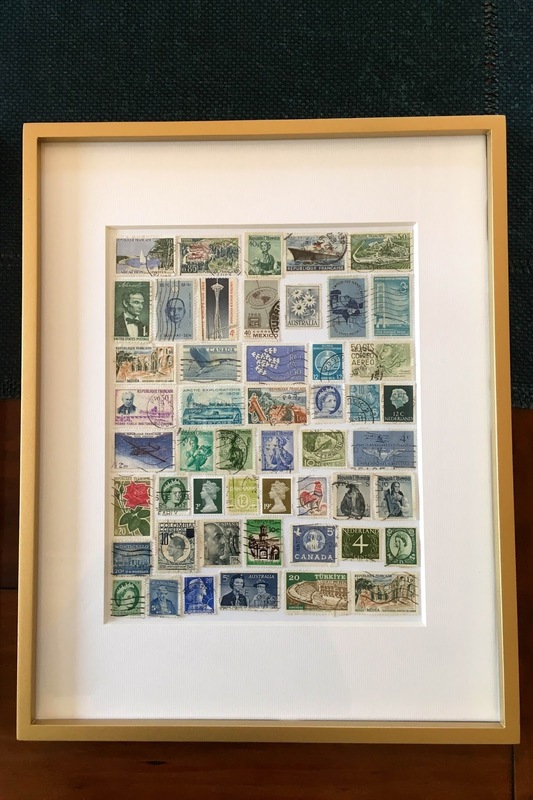 I finally decided to make some art with the stamps because they are so beautiful. They are now hanging in my daughter’s bedroom at the lake house. I love the way they turned out! What a great way to enjoy these everyday and so special that they were Deans as a child! I think they are so pretty with all the graphics and colors. 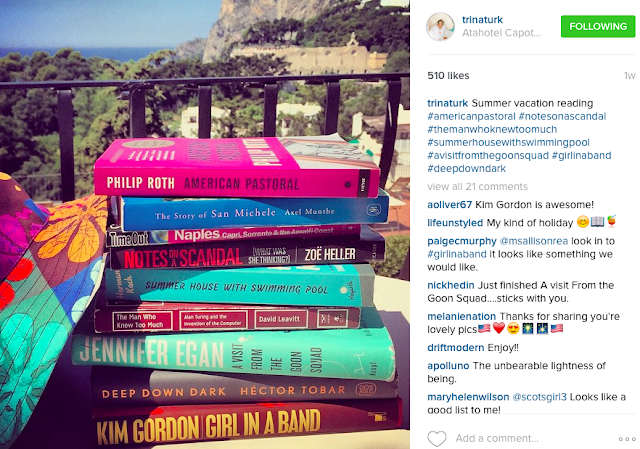 I know many of us have those books gathering dust somewhere and how nice to see them like this instead? 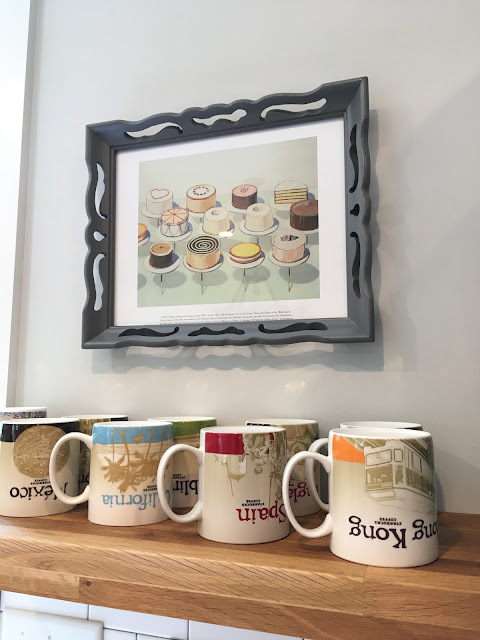 I love art in the kitchen and this small ledge is a great idea too for her mugs. Bonnie’s views from her windows. I could sit there forever and take in the view. Bonnie in blue, with her family! It is wonderful to see what one can do using a mix of family treasures, travel mementos and gems found through thrifting. Thank you Bonnie for sharing your ideas and beautiful home with us. 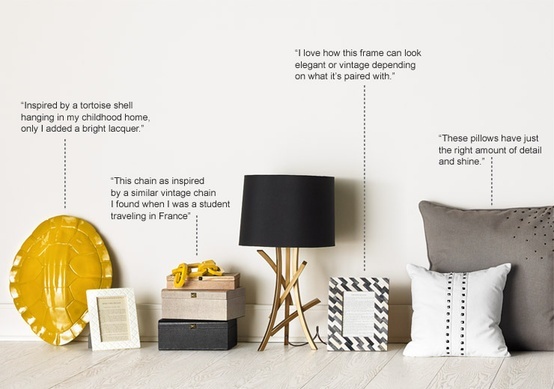 You have inspired us to think out of the box and make our homes uniquely personal! Pictures and art, except where noted courtesy of Bonnie Westman. Hello friends. Sorry I’ve been a little busy and I just haven’t been able to sit and write. 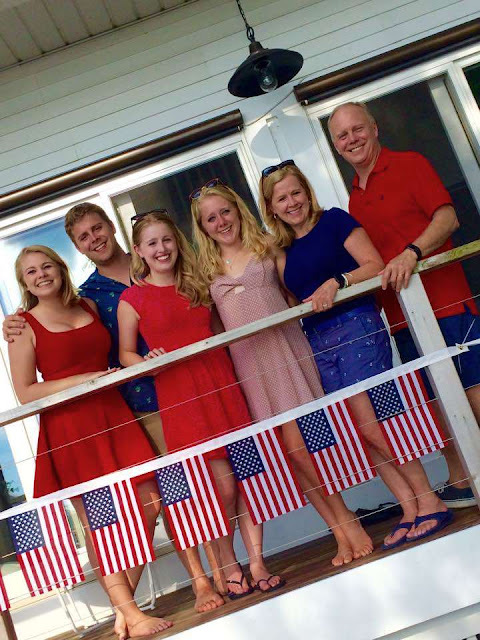 The past few weeks have been a flurry of Halloween, get-togethers, and lots of goings on. Though we did have some unusual October rain, it’s just gorgeous right now in the Bay Area and this week we are supposed to have 70s temps! I’ve been especially enjoying the warm afternoons and have been trying to get out to soak up some winter sun and marvel at all the pretty leaves. This is just a smattering and some snaps of what’s been happening around these parts. We had some fun at our annual street pumpkin carving gathering. Even my college son came back for this and he and his girlfriend even dressed up as Harry Potter and Jinny. So glad they are still enjoying this stuff. Another day we got to Marin County Mart. It’s a beautiful new spot with unique shops and restaurants with outdoor dining. We need more of those with our California weather! With my guys at the mart which was decorated so cute for fall. I hope to get back up there soon to shop and maybe have lunch. It’s a great spot for a day trip with a girlfriend. 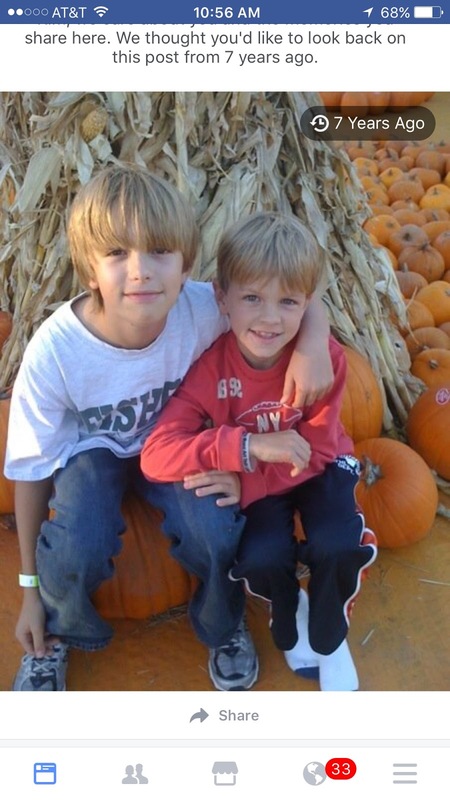 Halloween is just near and dear to my heart as I have so many fond memories of my boys and all their costumes. Gosh those years went by so fast. Loved this picture of them with plastic fangs. I had a bowl of photos with the kids in costumes through the years. Love! I keep getting Facebook reminders like this. I try not to reshare them all, but it sure is fun to see some of these pop up from time to time. Halloween and Thanksgiving decor seems to go well with my home. I have an (ugly) brown granite kitchen counter and a lot of black accents so just adding pumpkins and orange was easy. 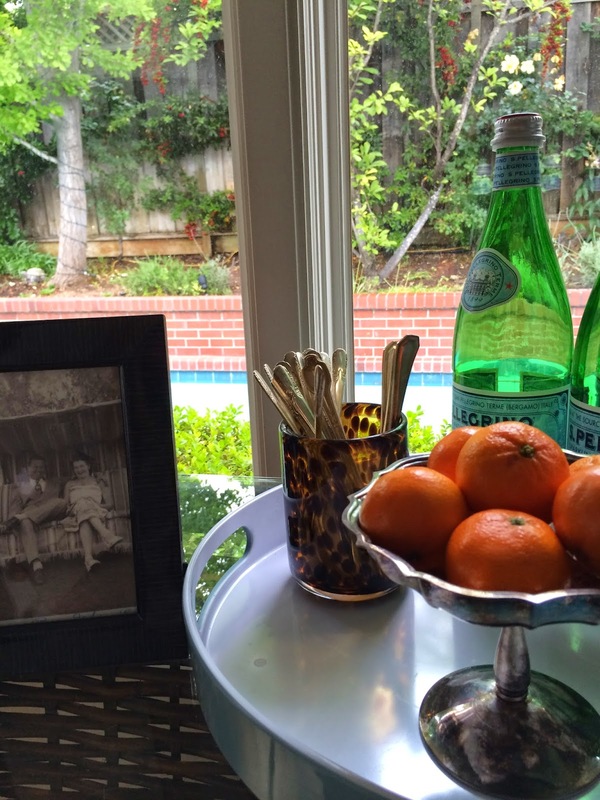 I love these mums in a rust color and any tortoiseshell glass like this bowl. 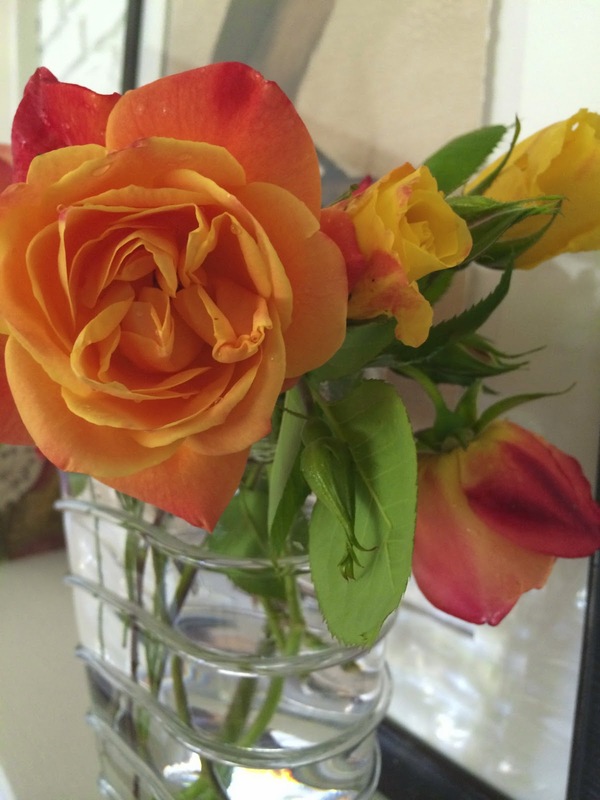 Flowers were from my favorite holiday inspiration spot, Bunches Flowers in Los Gatos, where Pete the duck holds court. I caught her posing (yes she is a lady), so I couldn’t resist snapping a picture of her. 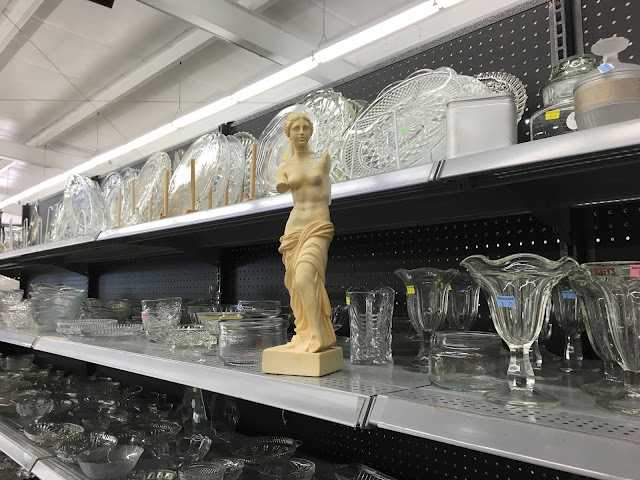 Besides all the cool jars and vases and pretty plants, I like to take a gander in here as it reminds me of visiting with my youngest in his preschool days to look for Petey. I’m nostalgic like that sometimes. The sign and also the pumpkin man were gifts from friends. Love them! Saturday mornings I go for a long walk with a friend and we occasionally stumble on estate sales. 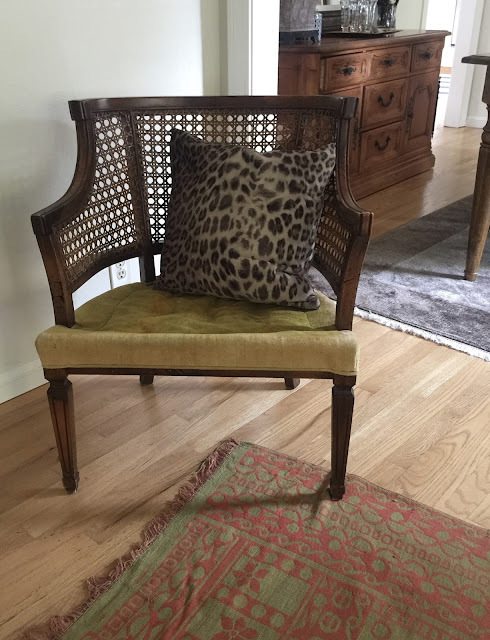 Last weekend I scored a pair of cane backed pecan chairs from the 1960s from a lovely old home. I think I’ll reupholster them in a cool fabric. I also got a great dhurrie rug (above) in fabulous condition from the owners travels. 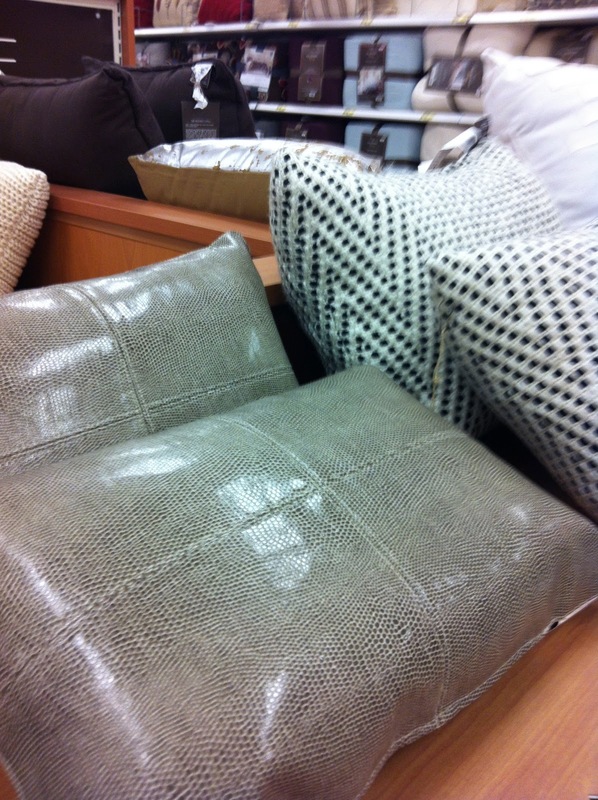 I threw some pillows on the chairs until I can figure out what to do with them. 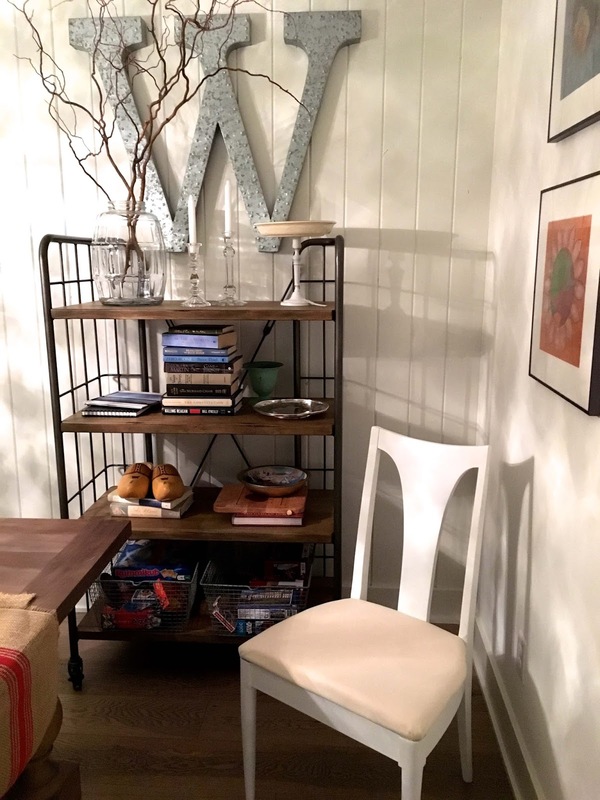 I love small scale chairs like this which are good for a game table between them, in front of a fireplace or just to fill a bedroom corner. 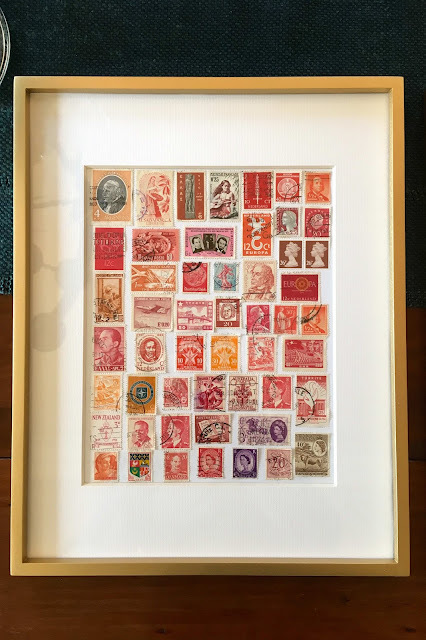 Estate sales are the best! Do not furnish your home in all new things. 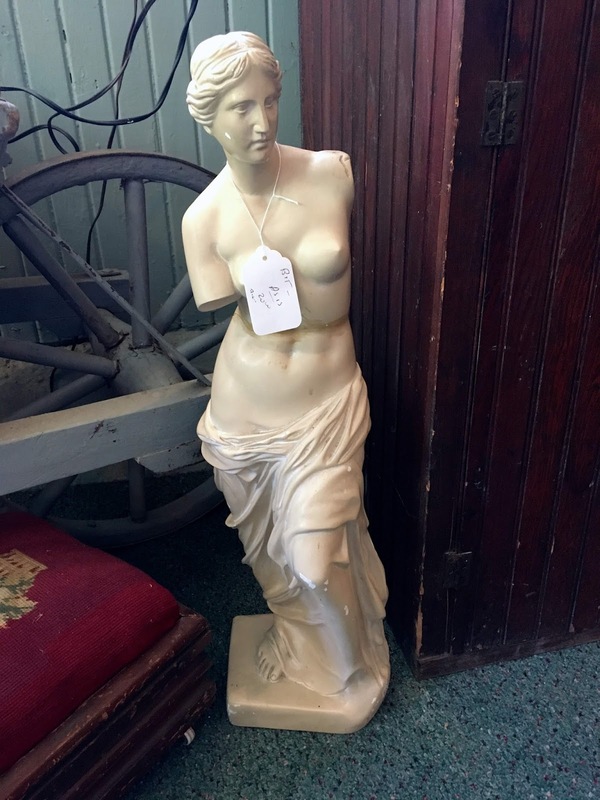 Estate sales and family heirlooms give it soul and make it uniquely yours! Our entry hooks filled with hats and costumes from Halloween with an original Halloween painting from my artist pal, Meilei and some of my other favorites. 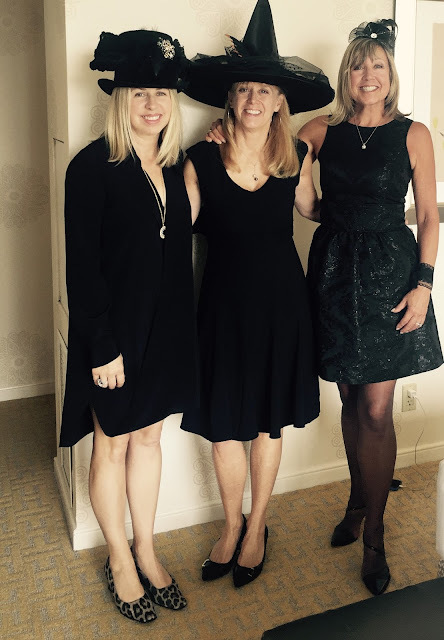 I got to wear one of those hats to the annual Wonderful Witchy Woman Lunch. With fun friends and here I actually thought I was tan a bit from tennis. Not! Hobbes the cat decided the new counter stools are his personal perch and only moves from them under force now. Does he not look determined? I added this short lamp on the counter for the winter months. I love the cozy feel lamps on kitchen counters give don’t you? They are great on dark mornings and so much warmer than the overhead lighting. This little slate sign in my kitchen makes me happy and it’s hiding a nasty old metal phone jack that can’t be removed. You can’t tell can you? Hated that thing and I don’t know why I didn’t cover it like this before. I’ve been using apples, pomegranates and persimmons in all my salads and as toppings on everything. Butter lettuce and red onions are good companions to any of that and a home made dressing of apple cider vinegar plus walnut oil and just a touch of maple syrup makes for a yummy fall dressing. I’ve got my winter garden in and have peas, radishes, cauliflower, and kale growing. My dad is my garden guy. he puts it all in for me and starts many of the plants himself and transplants for me here. I could never grow anything without his help! My dad Ray, has his birthday on November 8, election day. The first election he voted in was 1960, and he turned 21 that day and voted for John F. Kennedy. Isn’t that pretty neat? The voting age wasn’t lowered until 1971 to 18. Love my dad! This whole election has been so stressful hasn’t it? I have many friends who feel serious anxiety from it. Thank goodness it’s coming to an end finally. My 99 year old grandma Jody (dad’s mom) has seen it all and she cast her first vote and every vote since for a man and she’s ready for a woman to be president she says. She may be one of the only people still around who has voted in every presidential election from Theodore Roosevelt to our first woman candidate, Hillary Clinton! I recently took her out for one of her favorite things and In and Out Burger. Isn’t she cute? She’s smart, and sharp and fun. I feel so lucky to have her in my life still! My mother was also a big supporter of women’s rights and I have said this before, but I just wish she could be here to see the day we finally can vote for a woman president. She would be thrilled so I am voting in honor of my mom Sue, for Hillary. I know she would be happy about it. Okay that’s it. I’ve spilled my guts and got you all caught up. Later this week I’m going to be running some home remodel ideas by you all if your still out there. Have a good week and hugs to you all for being here and reading. I’m feeling really hopeful that this country will rise above all the discord and be together once this election is done. The view from our front yard this week!! 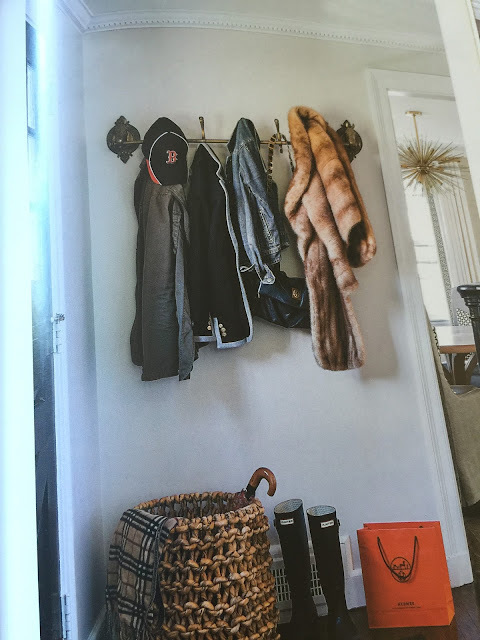 Just got my Architectural Digest today and immediately fell in love with Naomi Watts and Liev Schreiber’s beautiful Manhattan loft. I’ve been making some plans to renovate and this really inspired me. 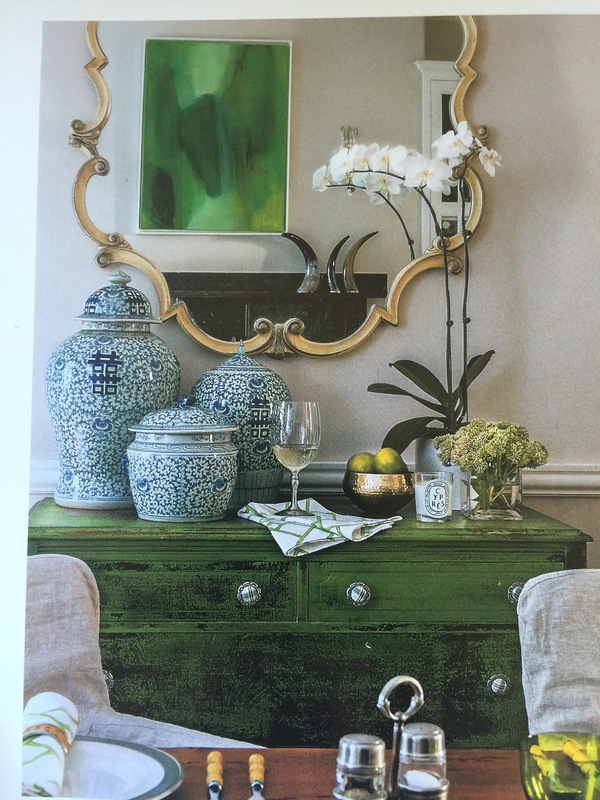 I love this mix of antiques and pieces from Ralph Lauren and Restoration. This entrance is pretty fabulous. The dining room has an antique cabinet and mirror that are wonderful for display, but also great for entertaining. I’d love to find something like this. I like this icy blue cabinets in the kitchen and the built in banquette. 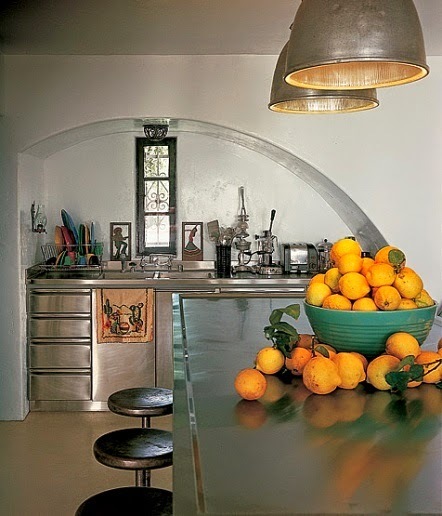 Kinda retro and reminds me of our kitchen as a child. The cute family with their sons. Another view of the dining room. The casual feel of the chairs and large table are nice. 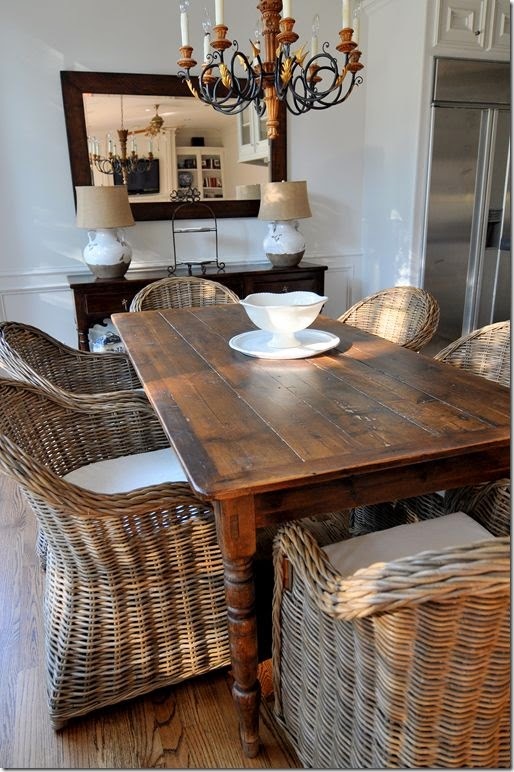 Seems so much more inviting than a very formal dining room. 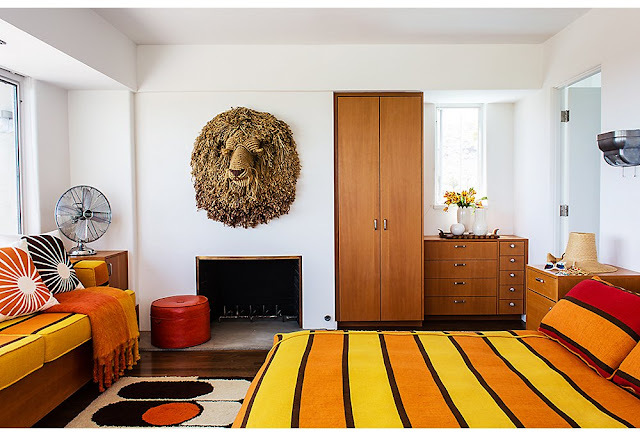 I know our family would use something like this.The light fixture and rug really make it different. 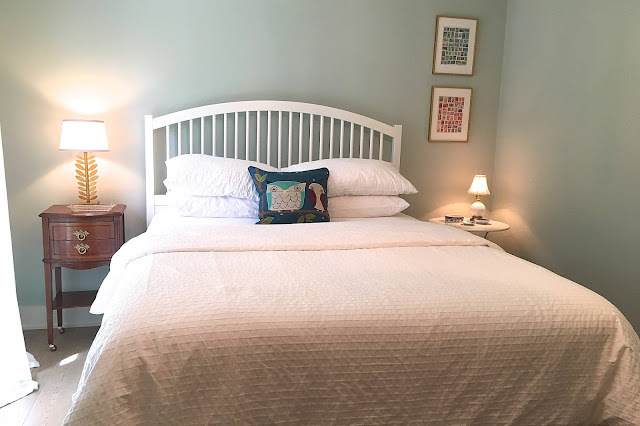 The boy’s beds are from Restoration. I think it’s so nice when kids share a room. Our boys did for a long time and sometimes I used to listen to their little nighttime chats when they were small. You can see the rest of the house here at AD. 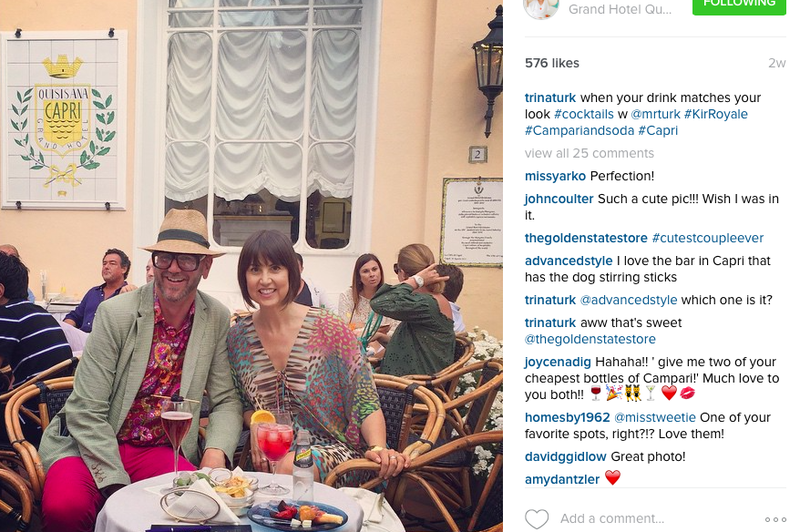 I think Naomi Watts has such great style and she has three movies coming out this year. 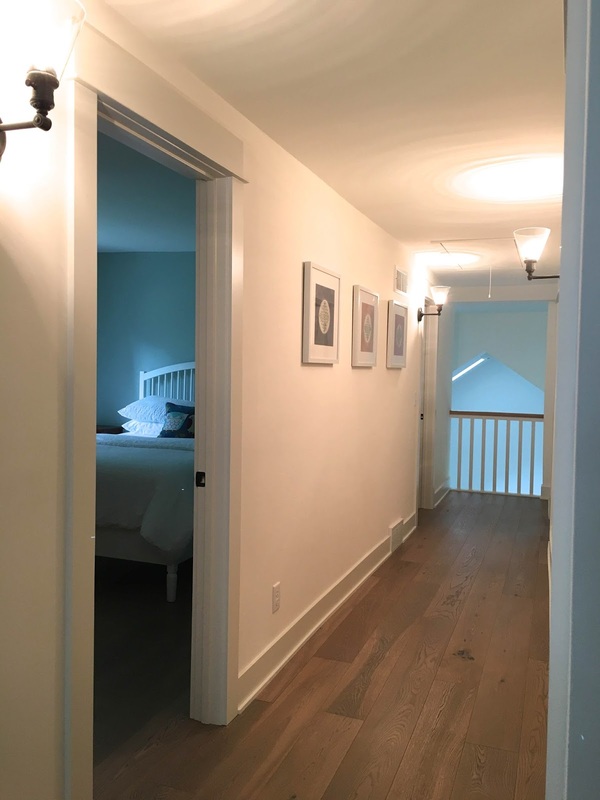 You can see their very pretty, totally different Hampton’s home here, which they had it on the market at the beginning of this year, but now are apparently renting for $20,000 per month. 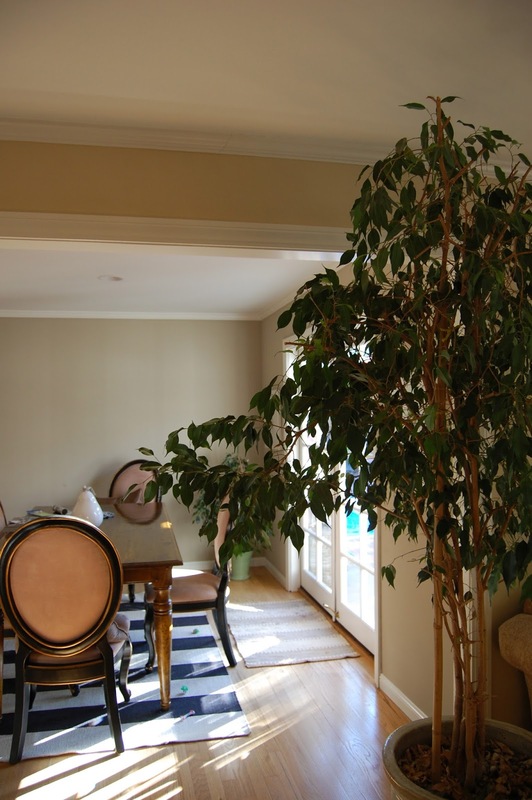 Naomi also bought this to die for ivy-covered home in Brentwood from Sally Field a decade ago. Smart girl! 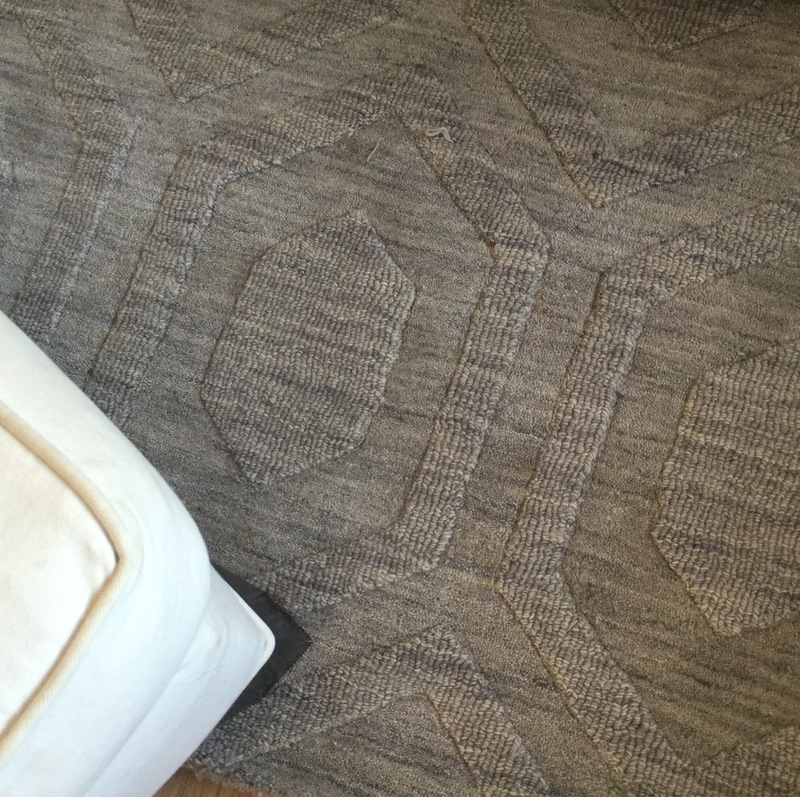 This wool HomeGoods rug which is modern looking with it’s geometric pattern. It makes the family room look a tiny bit hipper with our white couches, leather accents, oversized denim pillows and grey accents. Please ignore the cat. 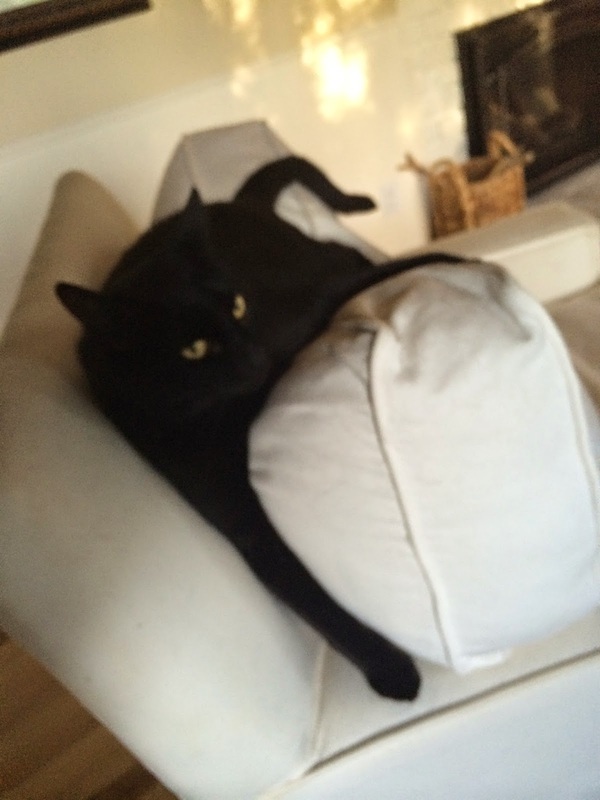 They tend to crush the tops of the couches into their personal dugouts! The other purchase, very radical for me, was this acrylic table! I have to say I am in total love with this piece right now! I knew I wanted it as soon as I saw it. 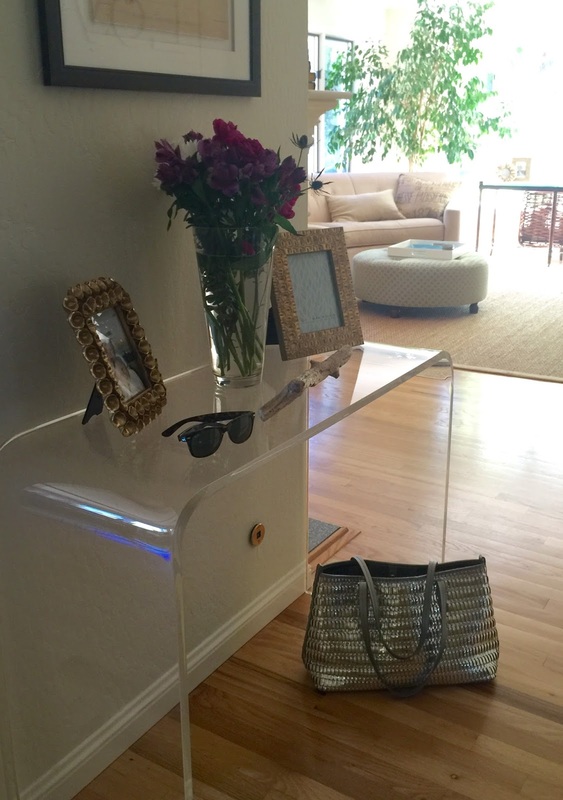 I wasn’t sure if I was going to use it as a bar, a vanity table or a desk, but I placed it in the entry while moving it in and it just fit there! 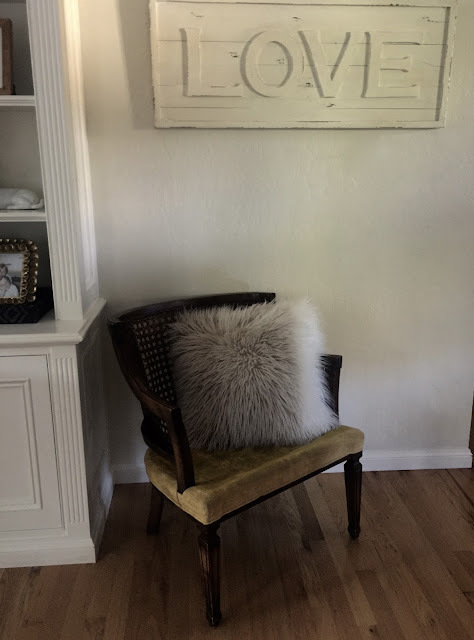 It makes the entry look chic, especially with the addition of the gold frames, which I am still filling and the bit of driftwood. 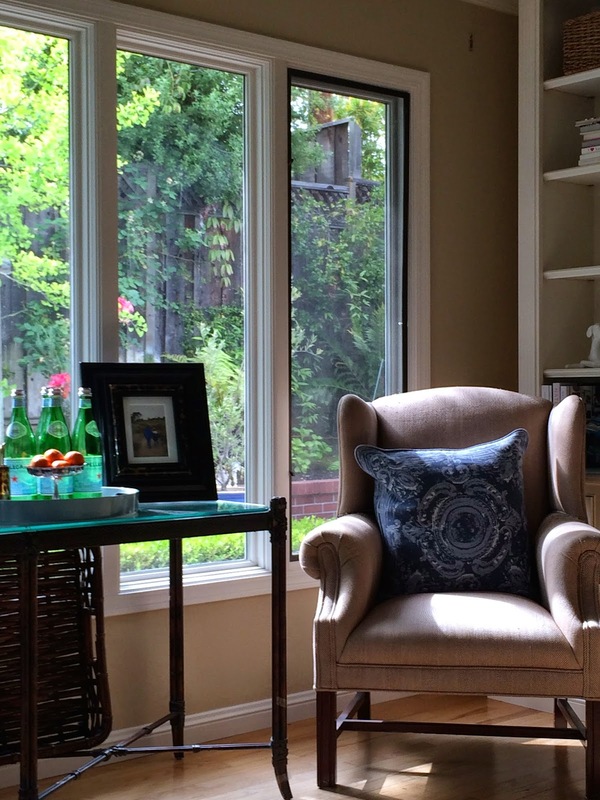 Acrylic (or lucite -same thing) makes rooms feel larger and more open as it takes up no visual space. It’s also bright, light reflecting and feels glamorous. I need more glamour in this house! 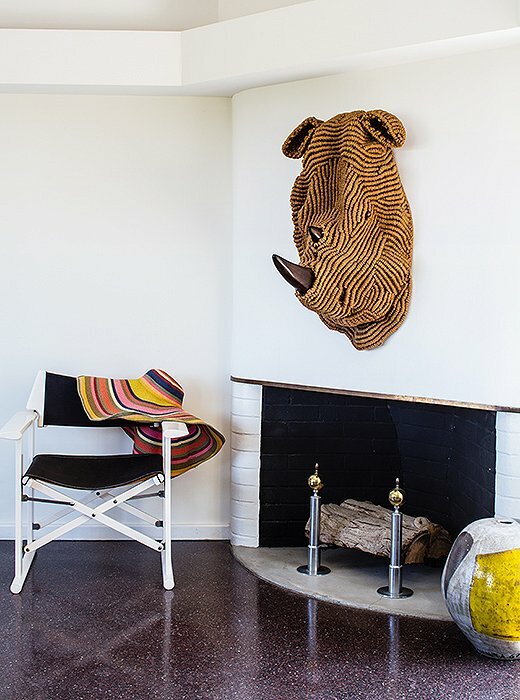 The drawback to adding these modern pieces, is that everything else may look a bit staid. I’m not advocating for everything new. That’s not me, I appreciate things with provenance and I don’t believe you need to change your your whole home, but you need to edit and refresh occasionally. Adding something like my table may be the impetus you need to do this. Your home can become bland if you are keeping tired accessories and photos in the same frames they have been in for 10 years. Save what you adore, but mix it up, add some color, move the furniture, and perhaps get rid of a few things! 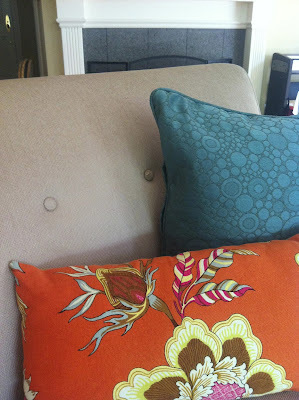 Also on my home to do this for fall is add some turquoise and teal to my living room. 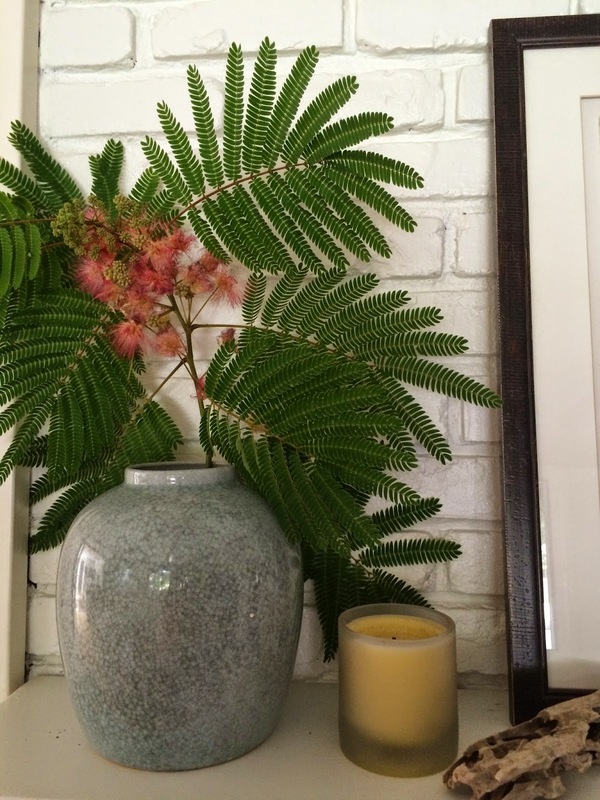 I have always loved that color and I am inspired by my grandma who has been a lifelong lover of it. She had a home designed around it in the 1950s and a wardrobe filled with it. Cleaning out her home, as we have been doing over the past months, I am encouraged to be more bold with colors! 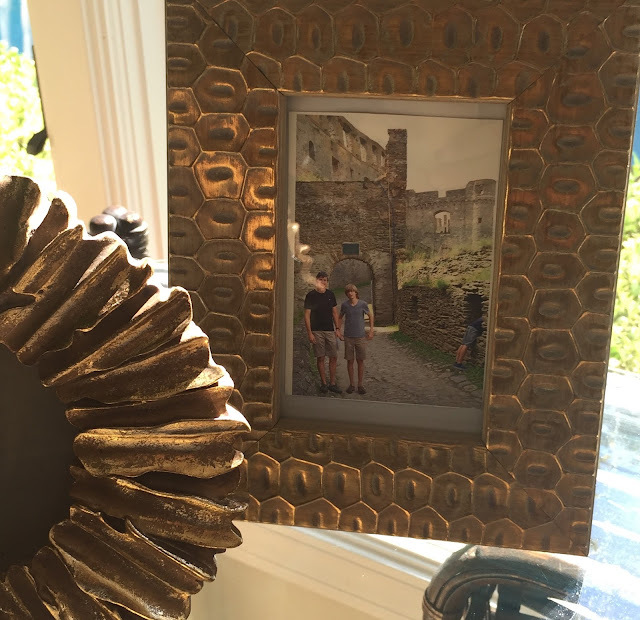 I think gold accessories add that bit of glam and I am changing a few of my frames out to gold and adding a vintage gold cat to the mix from my grandmother’s mid-century home. The gold is a nice foil to the deep aqua blues and the acrylic. I hope to get rid of some couches, chairs and old tables I’ve been hanging onto. It feels like we have too much furniture and I want a more open feel in my rooms. I might just go without for a bit and see how the space feels. Whatever gets added I want to love. 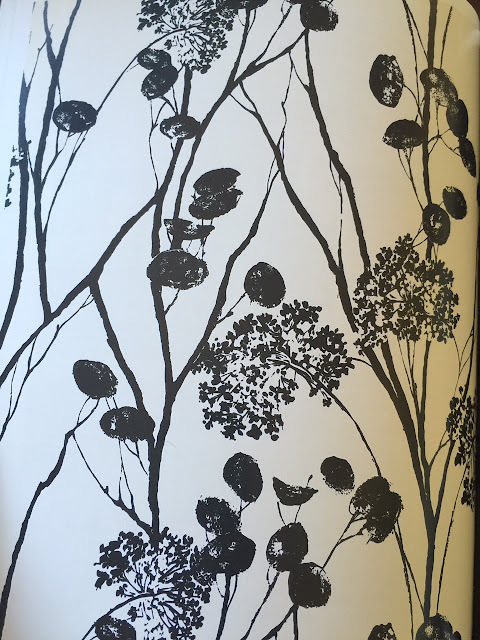 Wallpaper is another energizing and refreshing look Erin Gates uses a lot and I plan to take the plunge and wallpaper my entry and possibly my small dining area. Why not? I’m hitting 50 this month and feel like if I don’t have fun and do these things now I never will, you know? 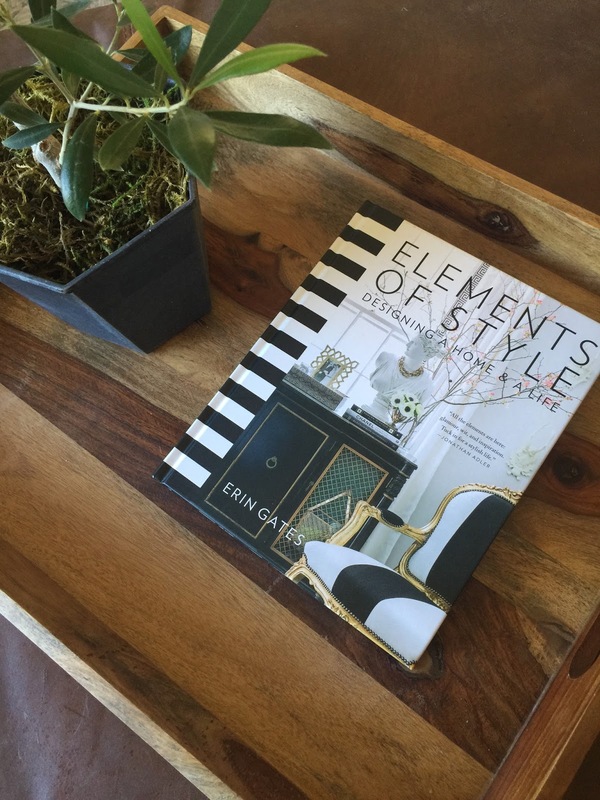 Right now Erin is also curating a sale at the home decor site Joss & Main. Her sale goes on until September 6th. 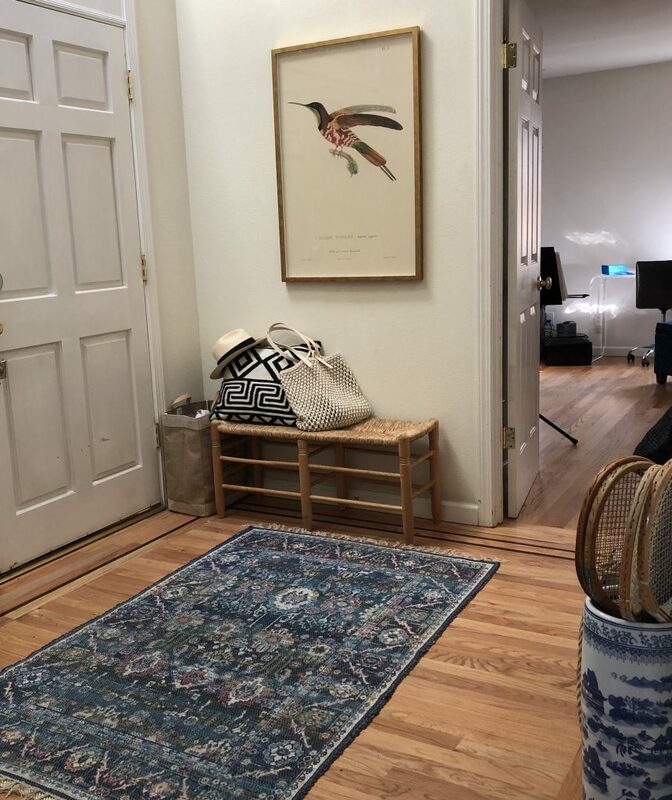 You can see more rooms she has done and some super little pieces she has picked for the sale there. P.S. If you are interested in finding a lucite or acrylic table like mine, I found this one on CB2. The size is closest to mine and the price isn’t bad. They can run upwards to the $900s so you have to shop around. I was lucky to get mine at HomeGoods, but haven’t seen them since. Look for something thick and sturdy. It should weigh a bit too. photos Elements of Style book and my own. 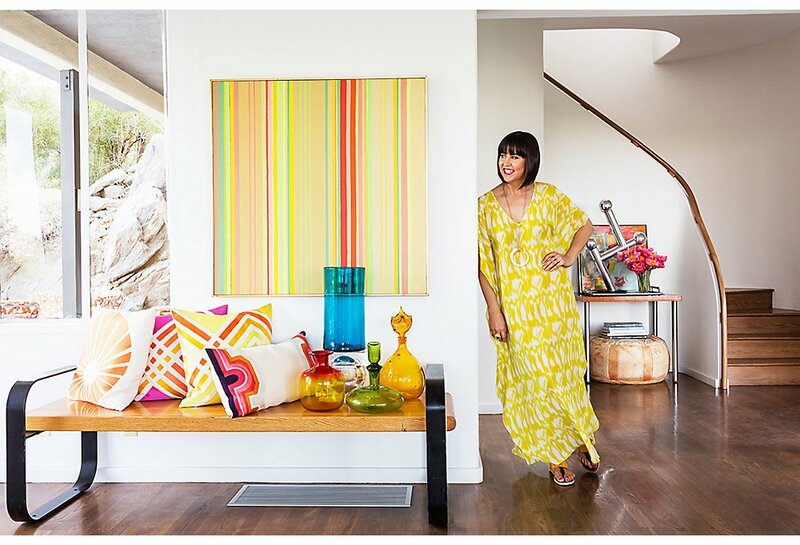 Everyone knows I am a big fan of native San Jose girl and California designer Trina Turk, so I was excited to see her Palm Spring’s home featured last week on One King’s Lane. 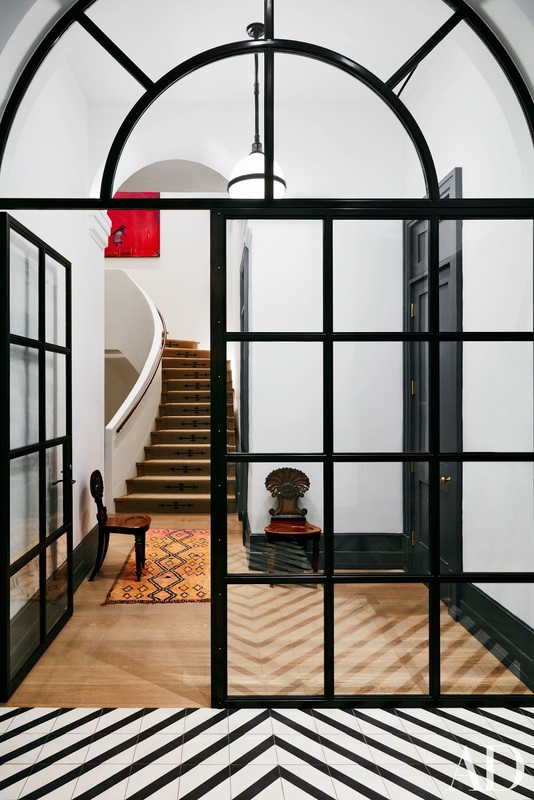 You can see more of the home which was designed to have the feel of a sailing ship on the site. 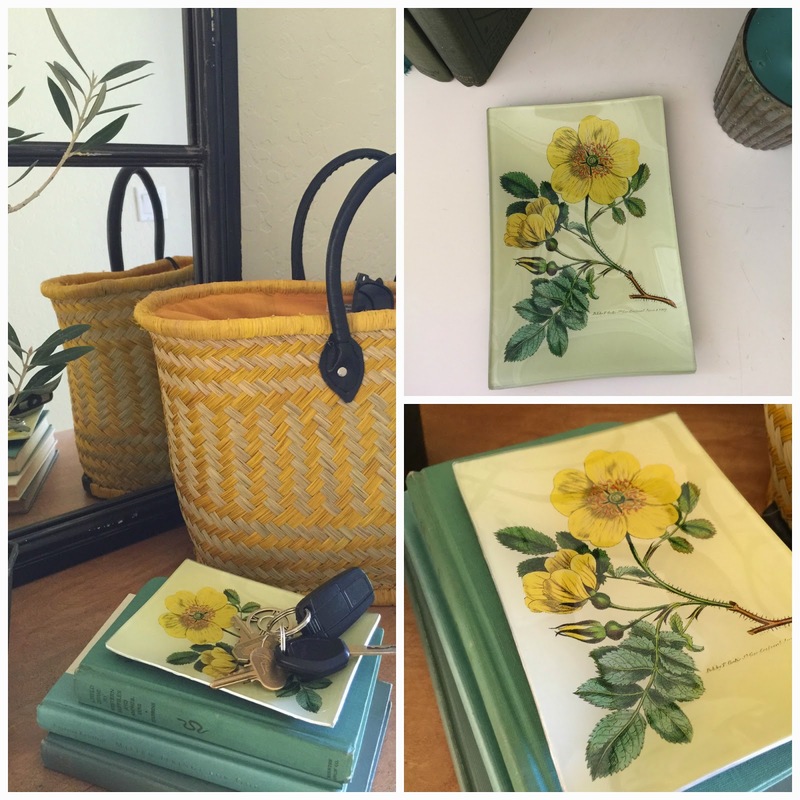 She helped curate the sale of similar home decor items as well. Trina and her husband collect these unique macrame animal heads and have 3 in their home. I like these opposing couches or sectionals if you will with her Trina pillows. The wood accents against the white are a nice combo for a desert home. 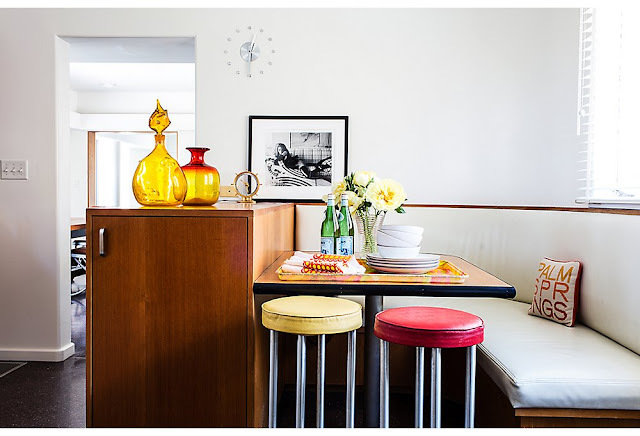 The home has an open and uncluttered feel, but has many quirky and cool pieces like this banquette. Trina also collects vintage sunglasses and costume jewelry. 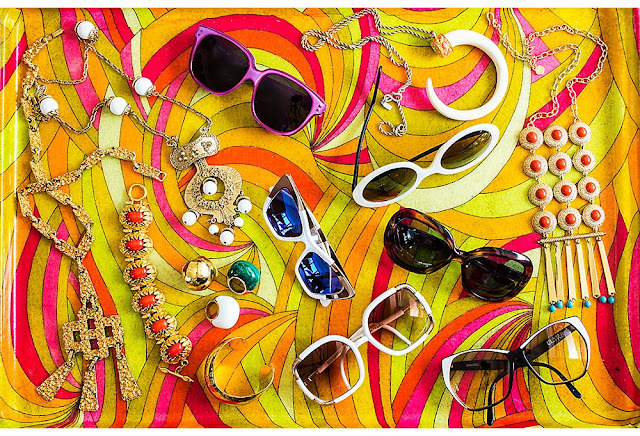 Not surprising as much of her accessories collection has a 1970s feel. The One King’s Lane piece shares Trina’s Palm Spring’s favorite spots to eat, shop and more. Her home decor collection is showcased a bit as well. I just added an Arcata pillow to my home. They also have a boxier version in yellow, on Trina’s own site which is pretty. So far this Emi 2 shirt dress is my favorite and you could wear it into fall which I like too. 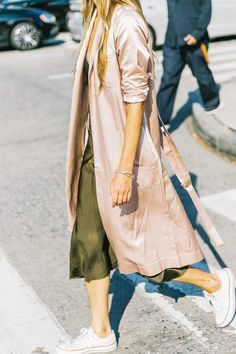 I kind of love this tennis skirt and jacket. I think this print is part of her 20th Anniversary collection. It’s fun to follow her adventures on Instagram too. She has a life made for all these vibrant clothes! 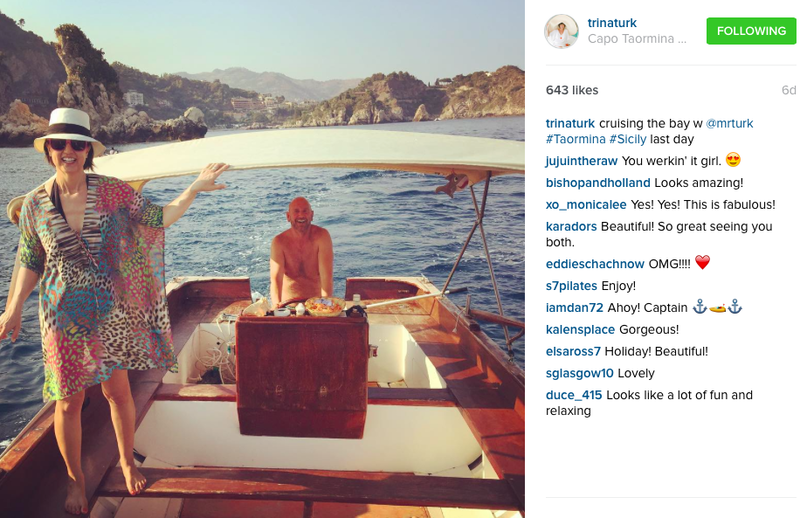 The past weeks she’s been in Capri, Sicily and many cool spots with her husband Mr Turk. 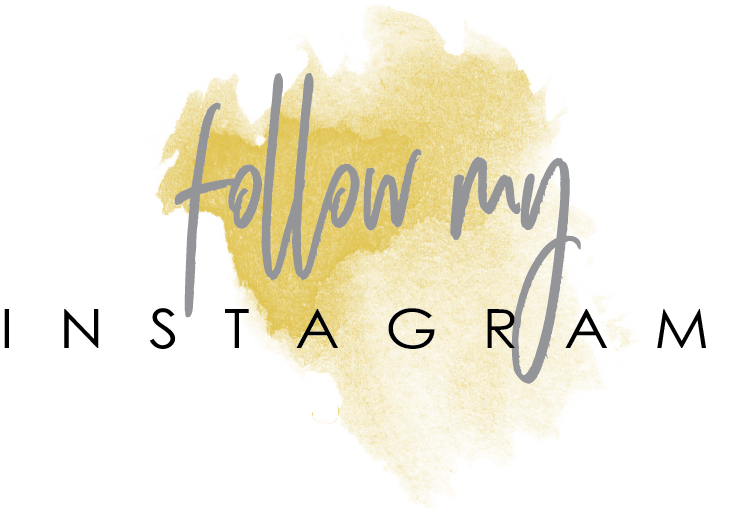 You can follow her here to live vicariously! Hello! 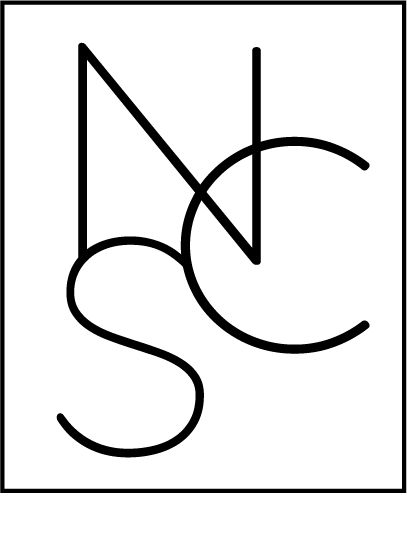 Today I want to share with you guys a sweet little company that has recently gotten on my radar and I am now obsessed with. It’s called Ben’s Garden and they specialize in beautiful glass decoupage trays that are beyond lovely and wonderful catchalls. Ben’s Garden contacted me a few weeks back and as soon as I saw the word garden I was sucked in. I wanted to know more. Ben Busko began making decoupage trays at just 8 years old inspired by his garden. By time Ben was 11, (can you believe it?) 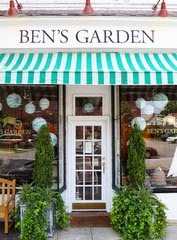 his Ben’s Garden brand notecards were selling at Smith Hawkins and The New York Botanical Garden Shop. 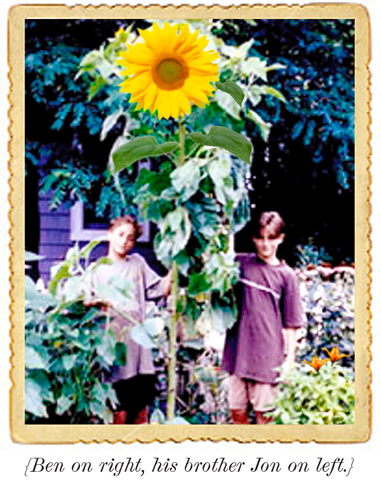 He ran his business out of his parents’ carriage house and then later completed the Master Gardener program at Cornell. Read this timeline about his childhood business- it’s charming!! 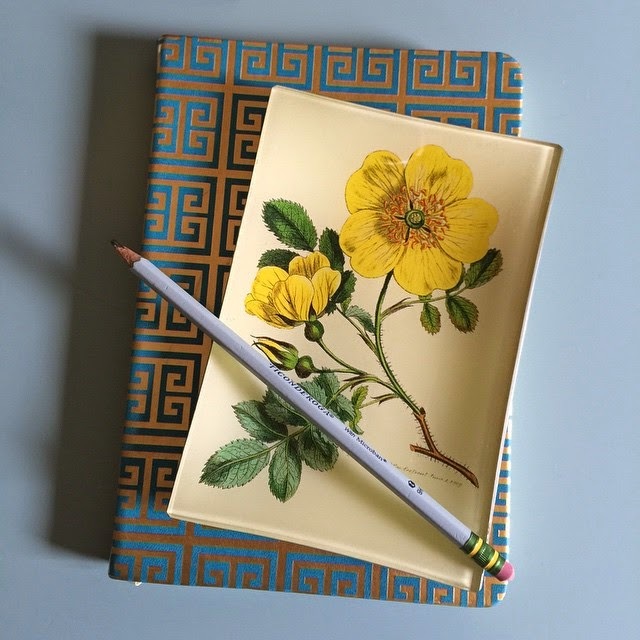 Today Ben has a huge online business of his trays, paperweights, notes and much more. 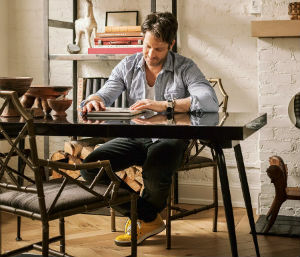 He also has two beautiful retail stores in Oyster Bay and Huntington, New York with two more opening this spring in Brooklyn and New York’s West Village. The retail stores sell unique plants, vintage furnishings, antique garden ornaments as well as his whole collection. That is so my kind of store and when I’m in New York this summer I’m making a point to check one out. 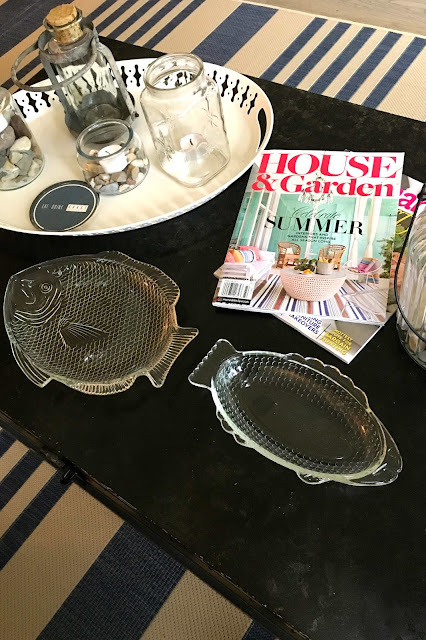 Ben’s Garden asked me to choose a tray I’d love and style in in my house. How wonderful is that? Honestly it was tough to choose since I adore botanicals as well as little quotes and sayings. 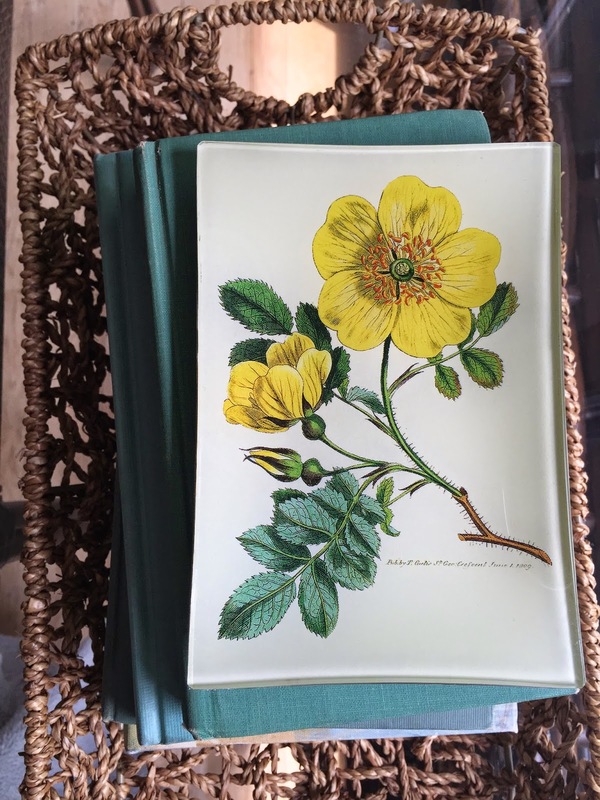 Well after much deliberation I chose this pretty yellow rose tray. I thought it would look nice with the turquoise and yellow accents in my house. That was also my dear mom’s favorite flower so it reminds me of her every time I look at it. So where to enjoy it? At the top photo I have it on my blue desk and it’s fun there for my phone and little things. In our library it was cute next to our collection of bird and botanical books, but ultimately it ended up on our entry bureau where I leave my keys, sunglasses and shopping tote. There I can see it everyday and friends who pop in can too. 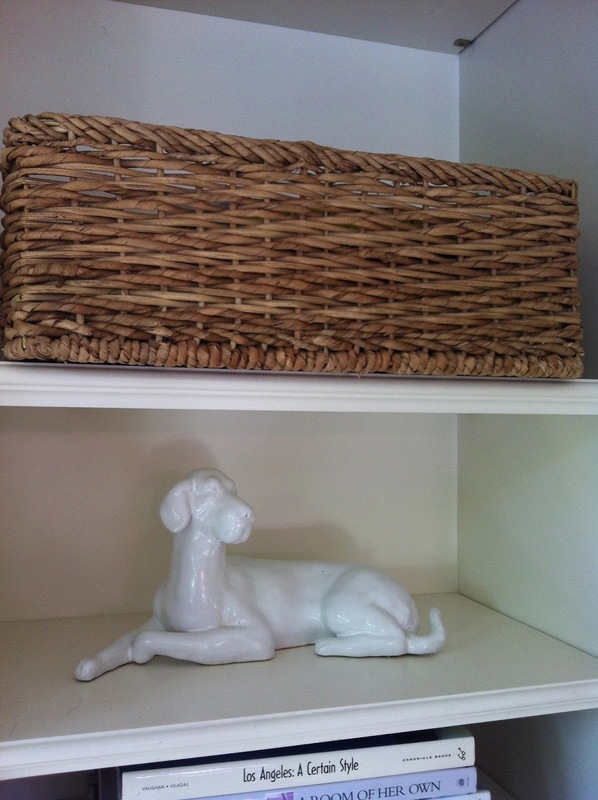 By the way my lovely basket is from my friend Andrea, The French Basketeer and you can find them here. 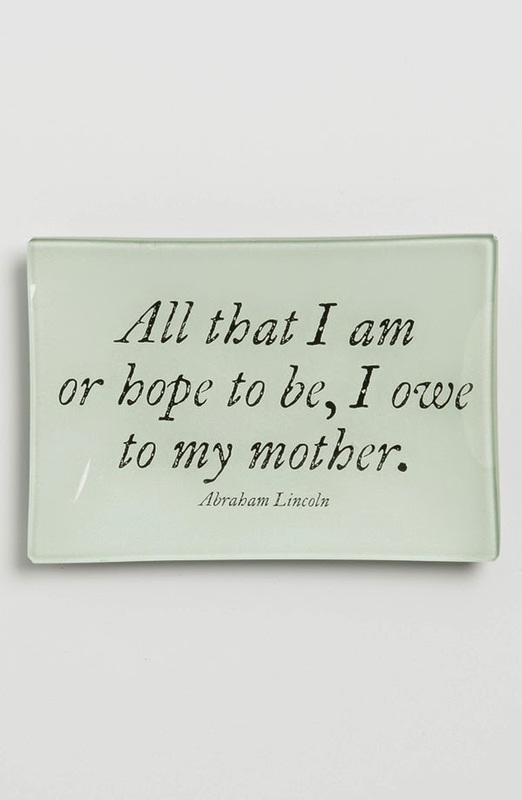 Speaking of moms, Ben’s Garden has so many pretty trays for mothers so it’s a lovely Mother’s Day idea. I’d love to collect these. 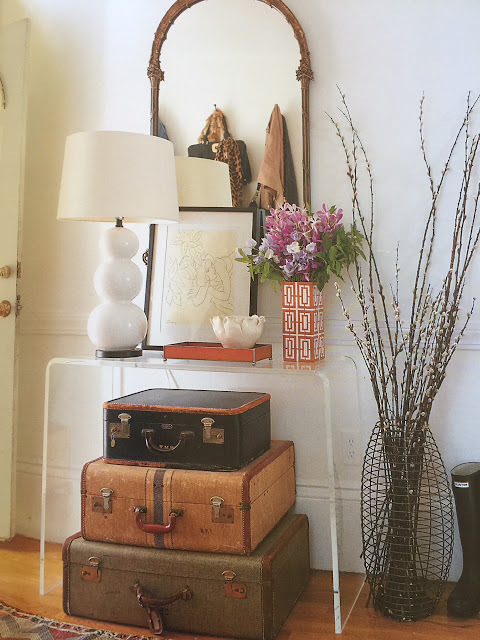 I think they not only add beauty to your home, but are useful little catchalls whether it’s bedside, in a library or in an entry they make a pretty statement and are chic! I love a pretty package…and ribbon! Some of my favorites in Ben’s collection right now you may want to check out…. Especially love this one…SO true! Pop over to look at the full shop. 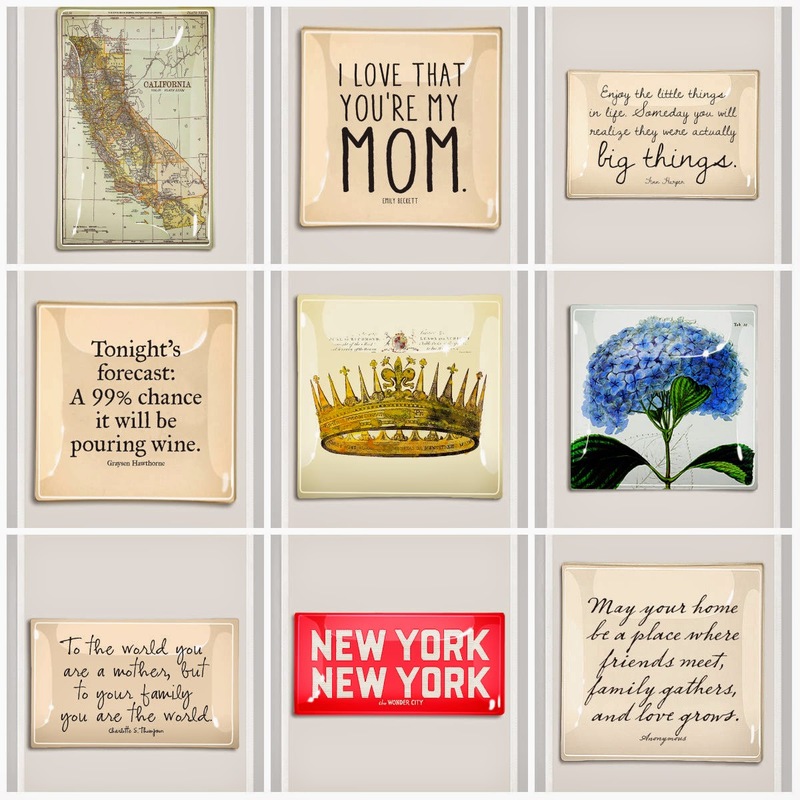 There’s a huge collection of glass trays, French paperweights, and more with maps, inspiring quotes and also beautiful botanical prints. Ben’s also makes custom decoupage so you can create your own with a photo or even a baby announcement or wedding invitation which would make wonderful keepsakes! 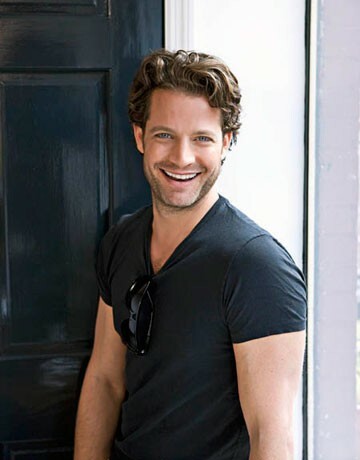 Ben’s products are carried online and also at 800 independent boutiques across the U.S. as well as at Nordstrom. Images NorthernCalStyle and also via Ben’s Garden. It’s that time again to get the home spruced up for the summer. Finally things have slowed down and I can give my house a bit of love. 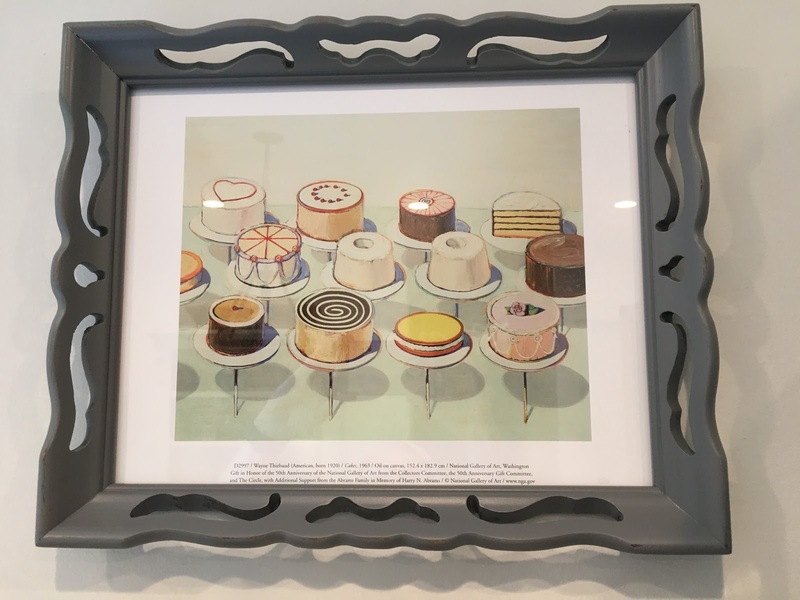 I recently found this a piece of art which had such a fun California vibe for my son’s room. Once I got it home I decided to keep it for our living room. It made me happy to look at it. (And let’s be honest was it really going to be appreciated in the boy cave? Probably not!) The bright colors made me want to change everything. I ditched my curtains, moved the furniture, and gave my beast of a ficus tree a haircut (I honestly had never even thought I could do that) and a new locale- away from my window. Now I have more window, more light and a another spot to read. 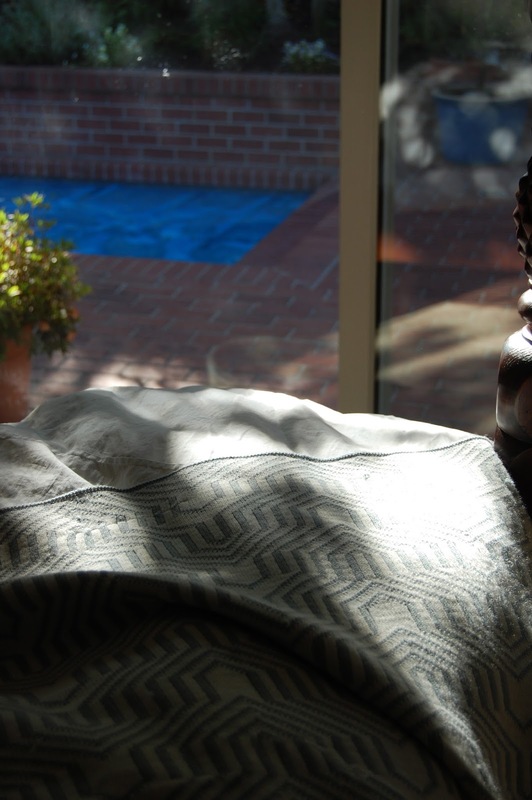 I love it and we are using that room nonstop now to enjoy the sun and just hang out. That’s huge for a living room, which often goes unused in most homes. That change up inspired me get the lead out, so to speak, in the main front room. First up was new counter stools for the kitchen. My friend Wendy, a decorator, has had some comfy counter chairs around her island for 4 years which get a ton of wear and still look new. So you know what? I copied her! They are all weather wicker from Pier 1, and I love them. Comfy and you can even hose them off. Let’s hope it never comes to that…However, with all the men here in this house it’s a possibility! In the purging mode, I got rid of my kitchen nook table and chairs. 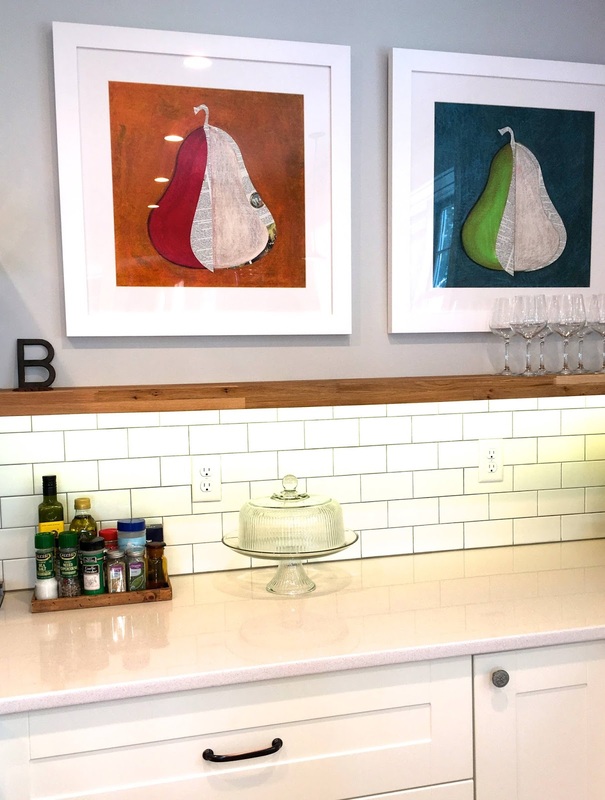 Why do I need three places to eat in a my home? My home is modestly sized. Crazy. Now my main room has so much room. It’s bright, open and the house feels huge. We can eat at the bar or the dining table. We are actually using the dining room instead of it gathering dust and enjoying it. Less is more! I am finding this is really the key to so much. Try it.. Sorry throws are kind of sloppy here- no staging done prior! Isn’t this dining room amazing? It’s one of Jeffery Bilhuber’s creations. I’ll have to do another post on him. All his rooms are beautiful, but inviting! 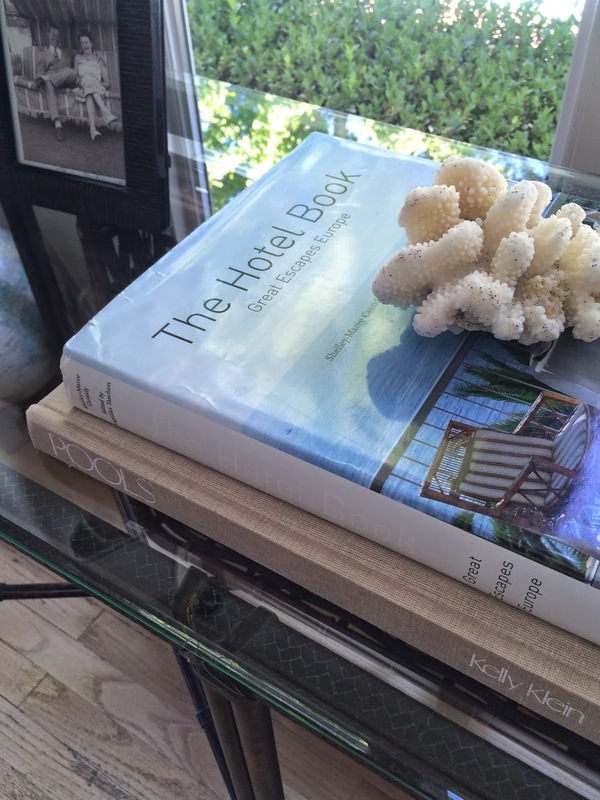 I wanted to share Jeffery Bilhuber’s tips for your Summer Home from Vogue. Clear colors- like pink, chartreuse and daffodil yellow say summer. Create as much openness and air as possible. Push furniture against walls, keep floors bare. Simplify. 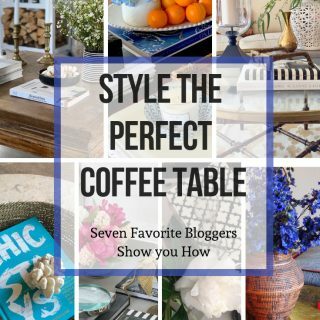 Edit your belonging, put things away, clear tabletops. 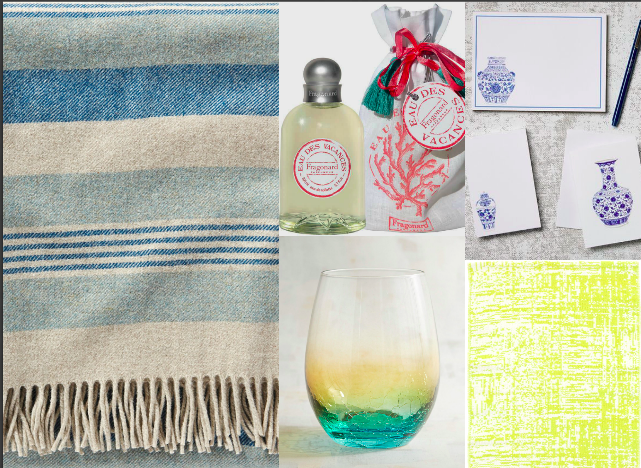 Add smells– a big bowl of lemons or summer fruits: tuberose or sea-scented candles. 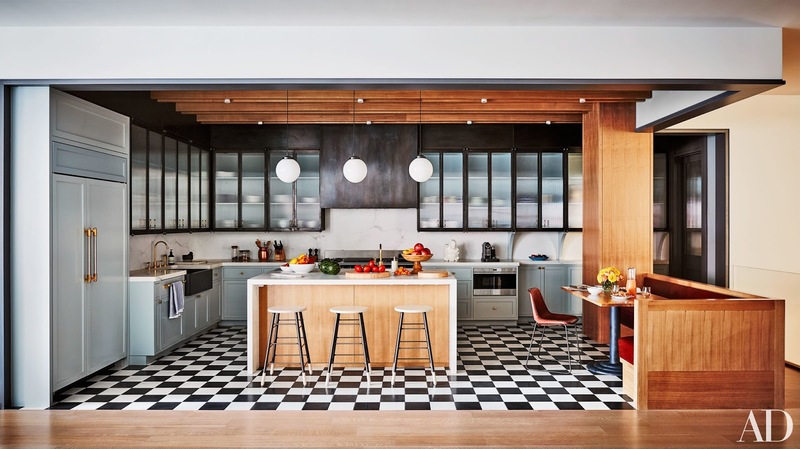 Diane Keaton’s Wallace Neff Home via Architectural Digest. 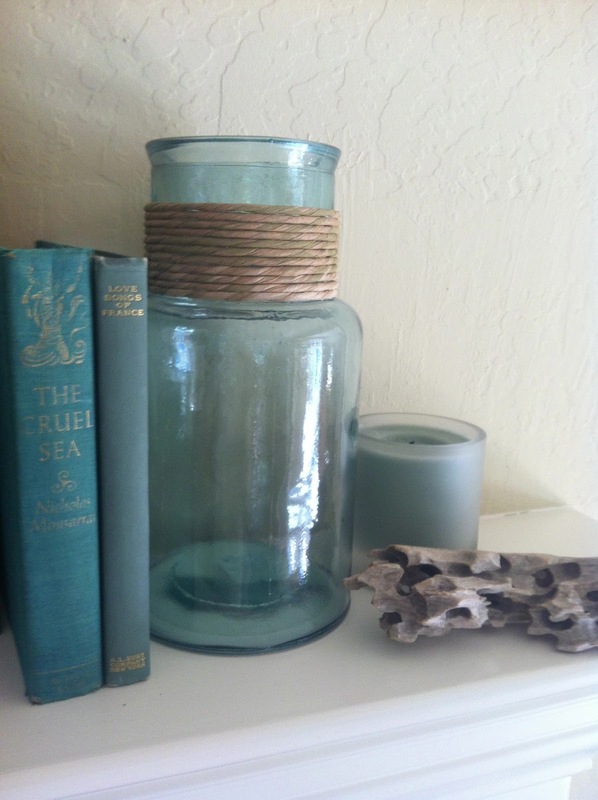 For the living room mantle, I used two blue glass jars, favorite old books and driftwood we found and a Restoration Hardware candle. If you have children, relax about their stuff. 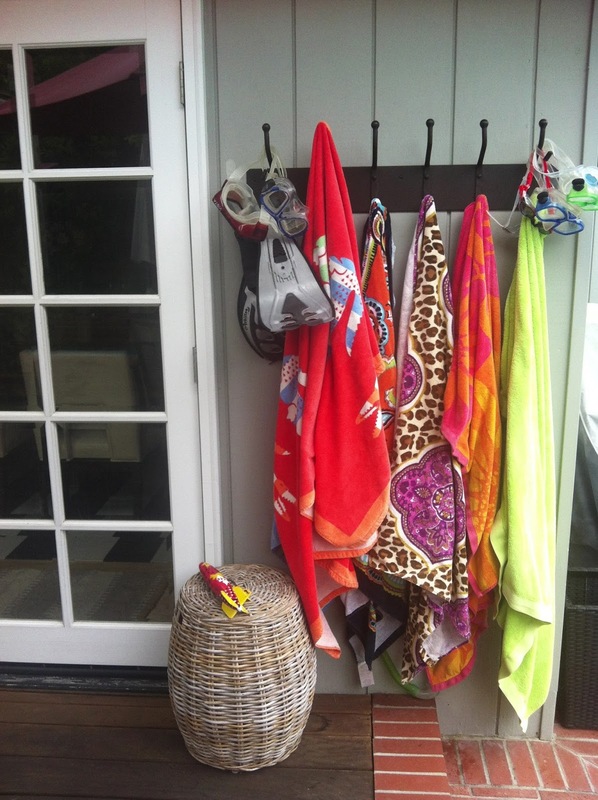 Swimsuits, balls, flippers, surfboards are fantastic to have around. This Pottery Barn coat rack generously holds a ton of suits, towels and more for my pool area. 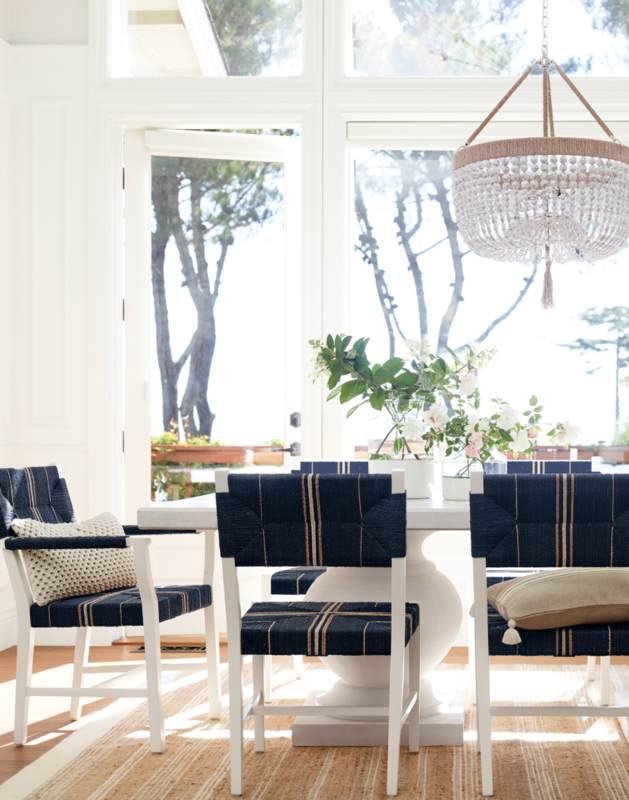 Use workhorse furniture and fabrics Add white slipcovers for summer freshness. 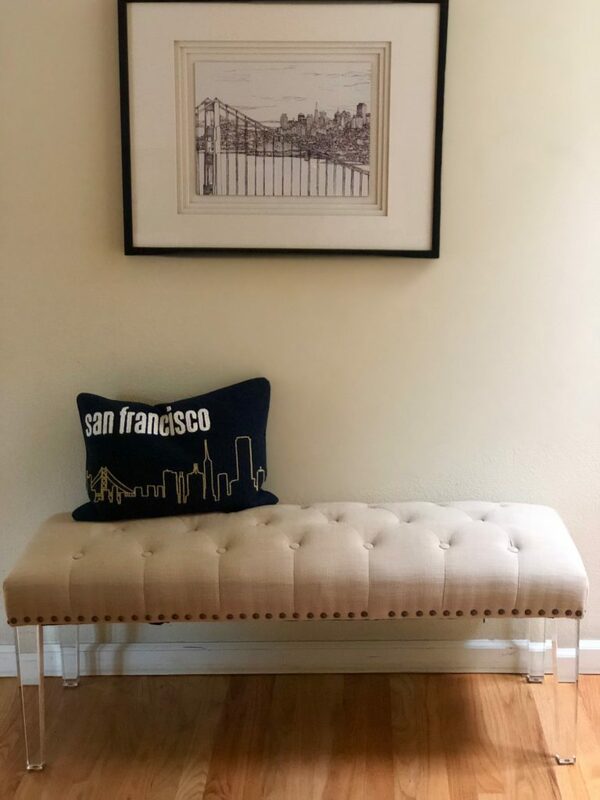 This white cotton duck fabric couch from Pottery Barn has been with us almost 10 years now. Washable and still holding up. Creamy white and brown accents is my color scheme in the front room. 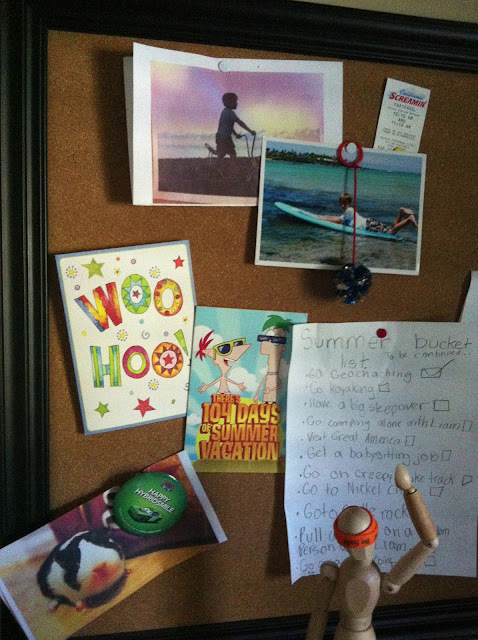 Put up a bulletin board where you can build a collage of memories: drawings, paintings, photographs and seashells. 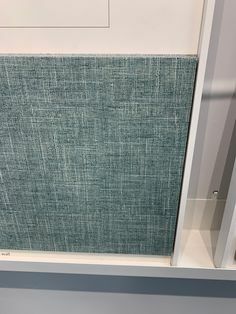 I found this bamboo and linen bulletin board at Aaron Brothers Art Supply. Add striped cotton or natural fiber rugs like seagrass or jute. 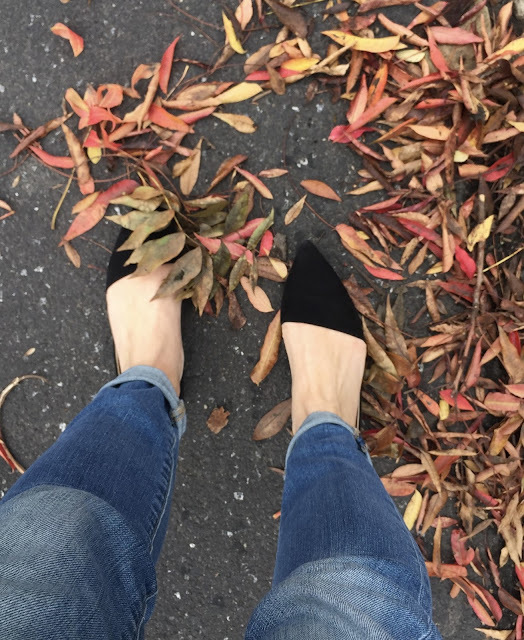 They feel wonderful under bare feet and are low maintenance. Bring your inside furniture out when entertaining. 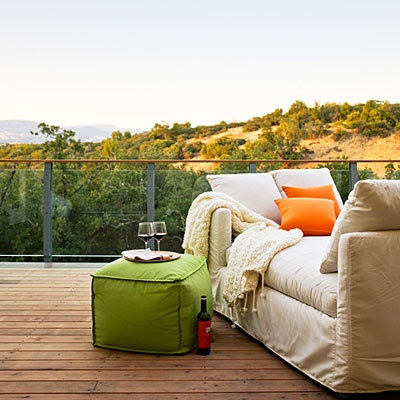 It’s okay to drag out lightweight chairs and couches, rugs to make your outdoor space more inviting and comfy. 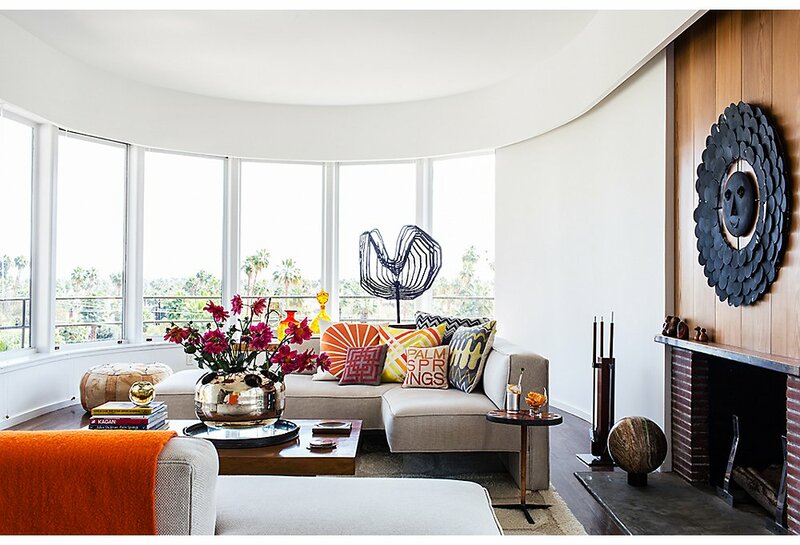 I love adding my favorite piles of throws and colorful pillows to my chaise lounges and chairs. As long as you don’t leave them for an extended time, they are fine and so much more comfy than outdoor pillows. 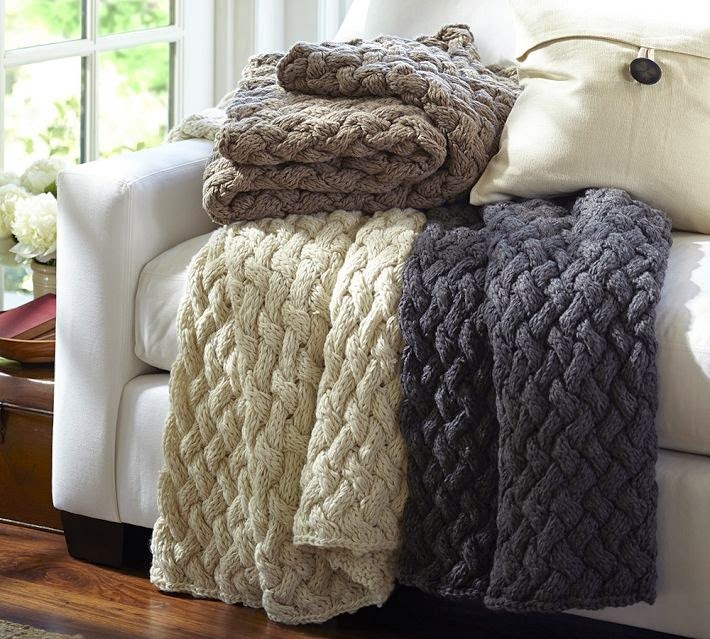 I love these Pottery Barn cable knit throws. Like a soft sweater. 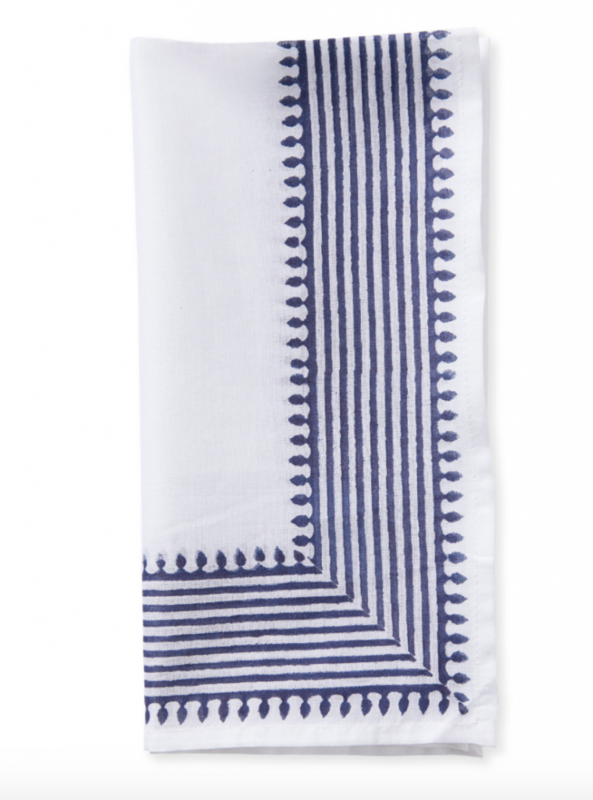 Bring Stripes In for a Summery Nautical Feel. Even on dark pieces they lighten things up. 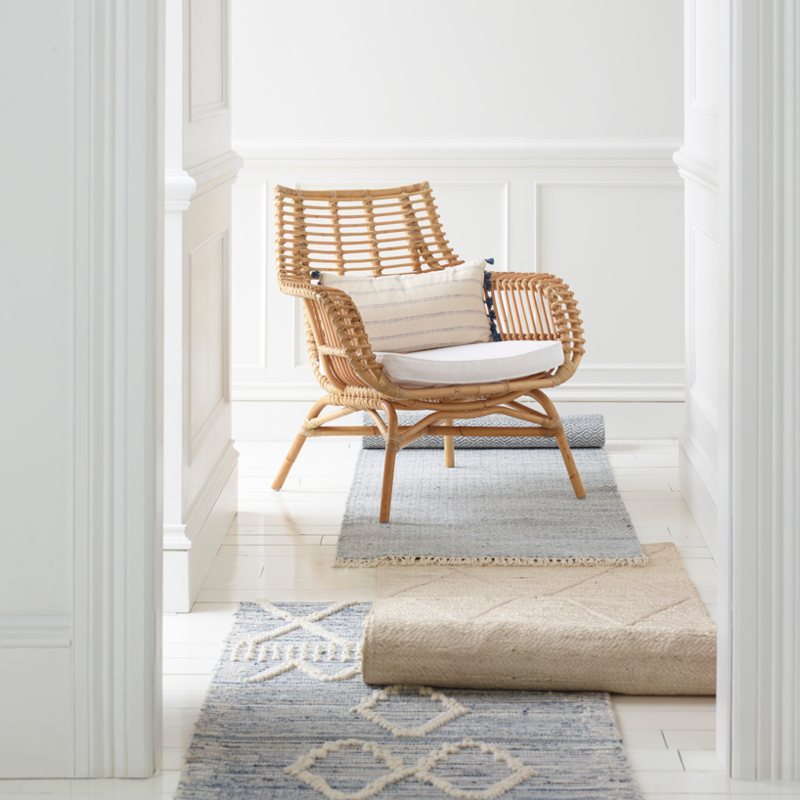 Add wicker and woven pieces to your indoors. Just adding a bit of a natural look will give you a lighter feel. 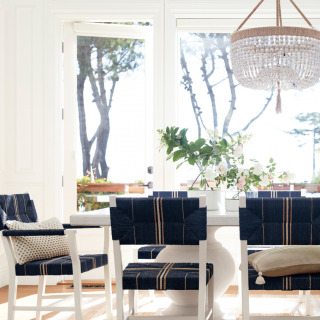 I love the look of a woven chair around a dining table. They look fresh and they invite you to linger and relax at the dining table. They are also easier care. Everyone has them now, so check them out as an indoor option! I am hoping to do something similar in my dining room. 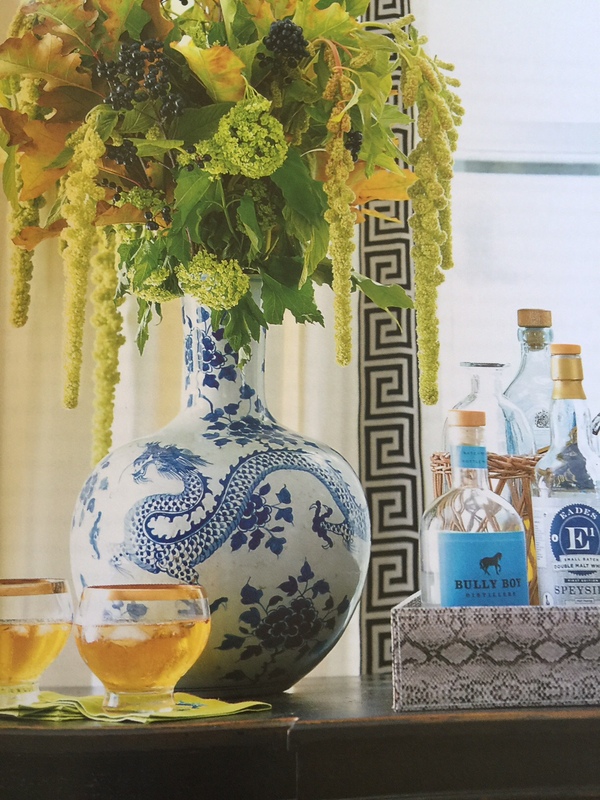 Baskets look great as bar trays or to hold magazines. 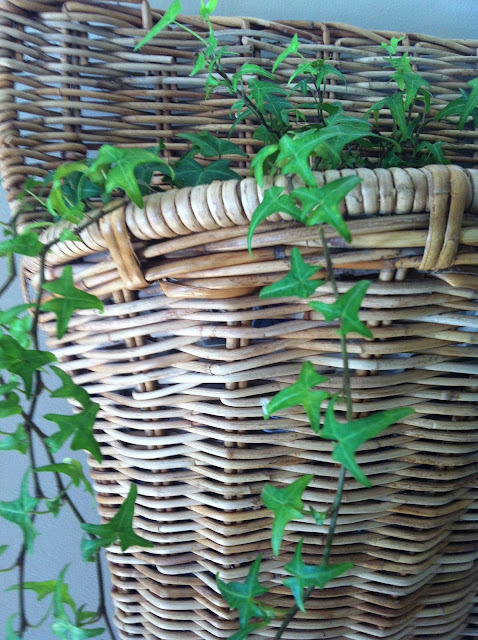 Baskets keep you looking organized even if you’re not. They also look good hung from the wall with plants. The natural color of them looks so summery. 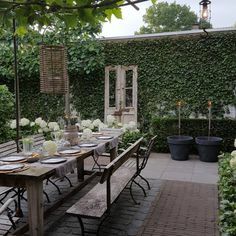 I love the addition of ivy everywhere in summer months! Change out the towels in your bathrooms to brights and lights. 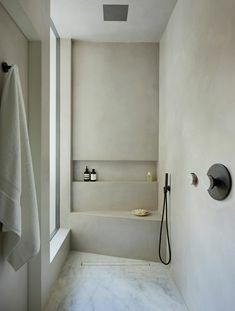 Add a fern, ivy or other plant to give the bath a bit of green. 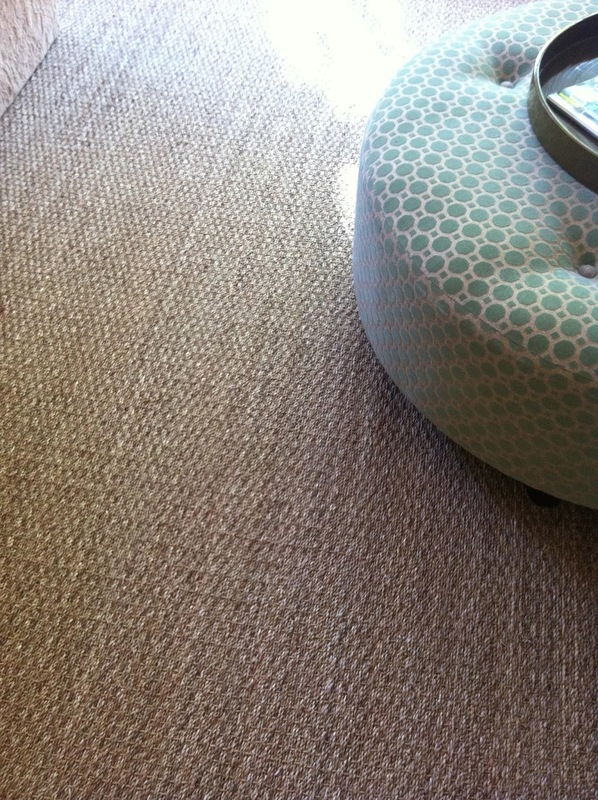 I love this garden stool from my grandmother in my bath and found this dhurrie rug to match. I like the bright yellow and sea glass blue mix in here. Remove all the winter bedding. Wash everything and let it dry in the sun before you tuck it away. Then cover all the beds in white sheets and cotton blankets and a fun throw in a pattern or sherbet shade. 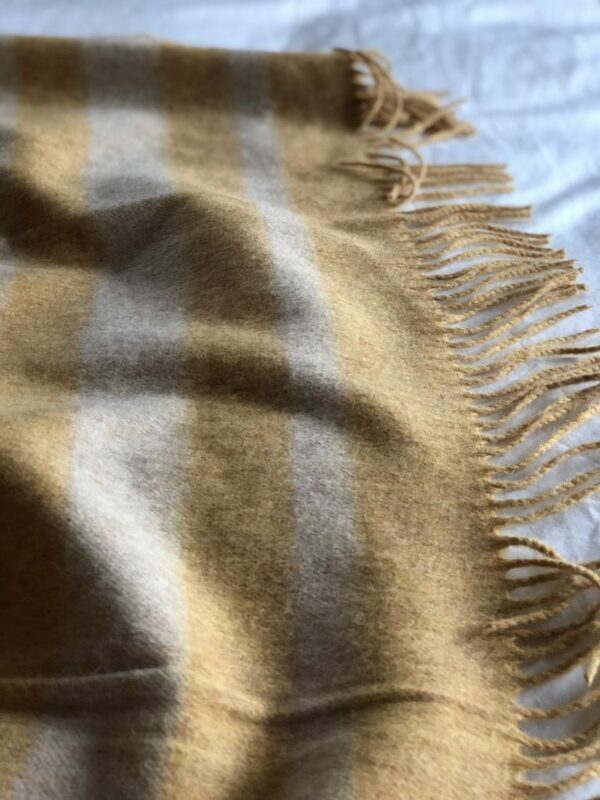 I just changed everyone to white sheets and duvets and have cotton throws like this one on top. 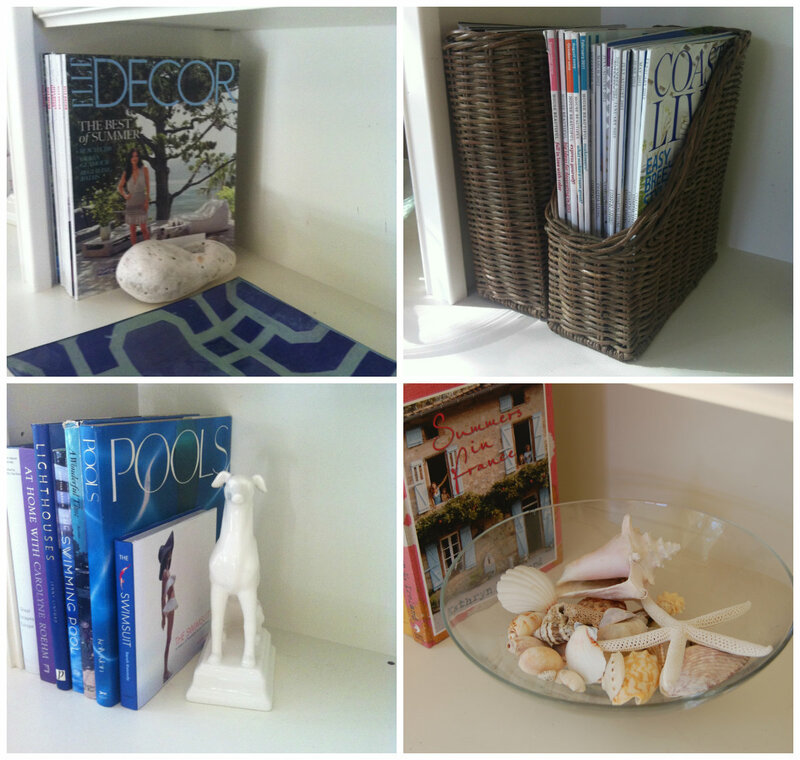 Display summer books, framed photos of favorite summer vacations, or shell collections. I like having a photo album of past holidays or a pretty bowl with photos to browse through. This is a great time to keep things light and bright and store away your usual accessories and photos. 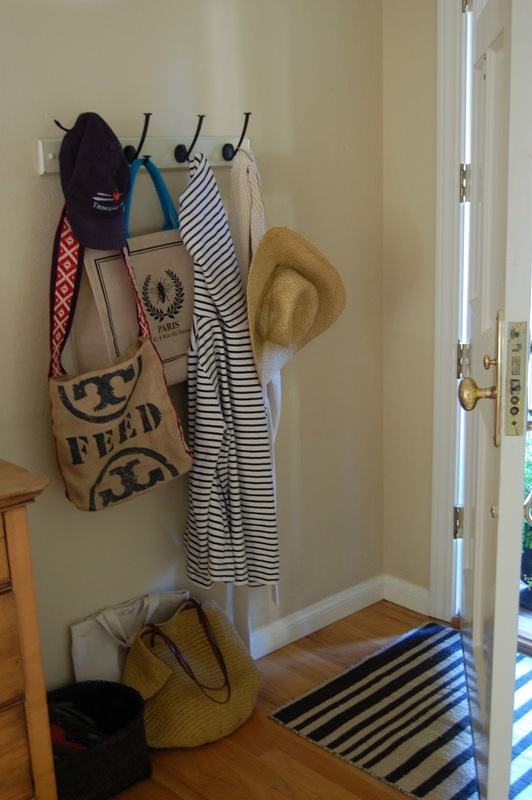 Make sure your entry or mudroom isn’t still loaded with coats and boots. It just evokes summer to have woven bags, caps and straw hats hung from hooks. Baskets for flip-flops and espadrilles look wonderful as well! Change out your art. I love a vintage summer photo blown up. You find a something that says summer to you. 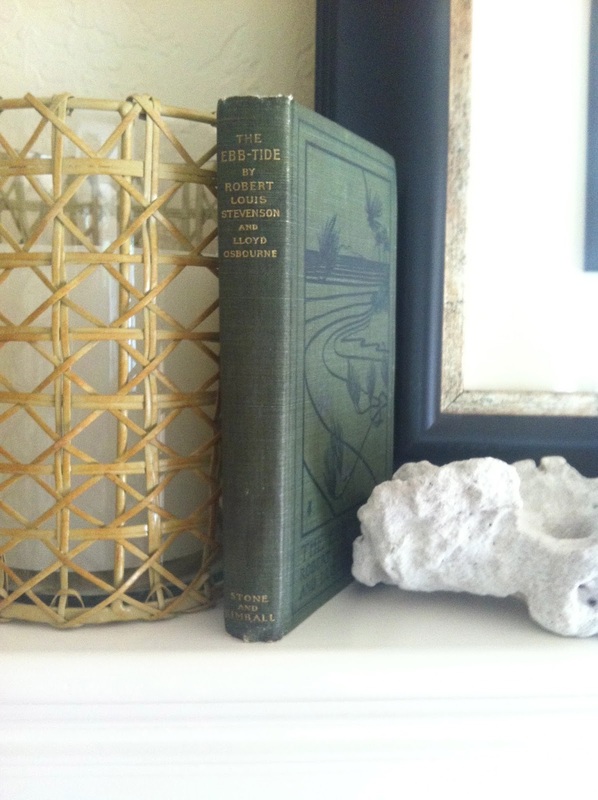 A souvenir of a past holiday, like a print or a book may be wonderful as well displayed. I love this egret print and it’s white tones so I just moved this from a bedroom to my family room. 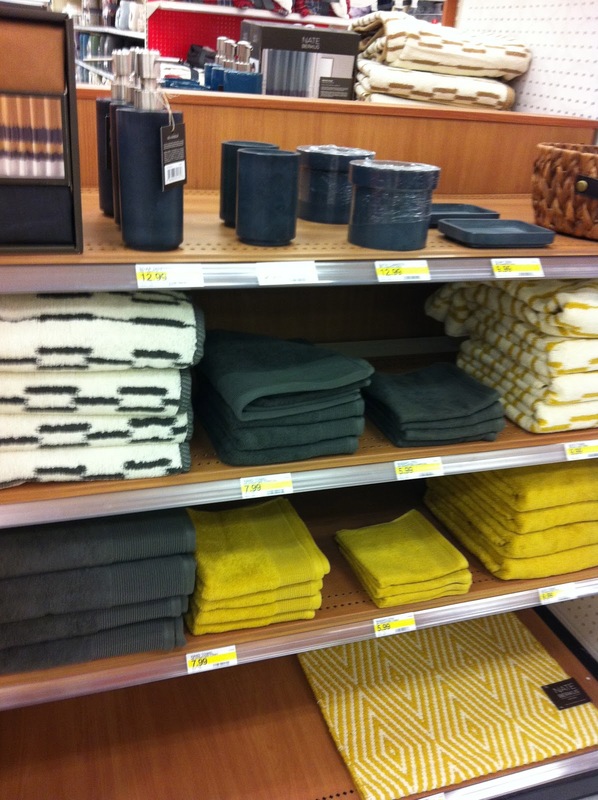 Have fun to staging your home a bit. You are doing it for yourself. You have to look at it every day and be there. Surround yourself with what you love! For more inspiration, I started a Pinterest board called California Style and it’s got some gorgeous examples of light and bright and natural homes I’m in love with. Images property of northerncalstyle unless noted. Wanted to get this post out quick. The new Nate Berkus Collection hit Target last week. Though it was delayed at some spots I found it at two stores near me. Quick get out there if you love Nate’s great taste. 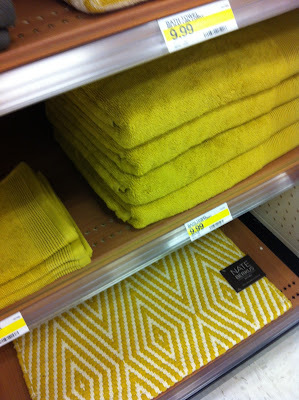 The quality of the towels, and home accessories is in my opinion excellent and not your usual Target fare. 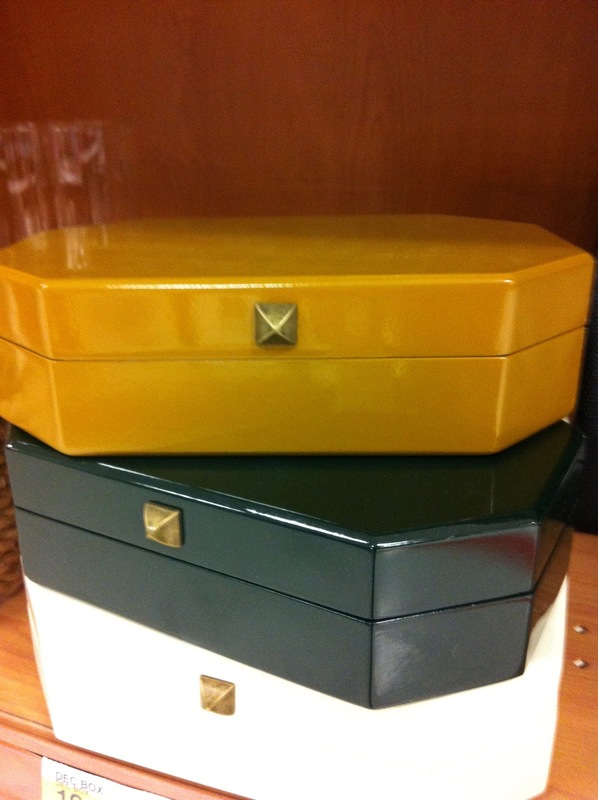 I bought a beautiful wood box and want to go back for a lacquered one, like above. From the Target site above.. I loved the snakeskin look boxes and pillows. 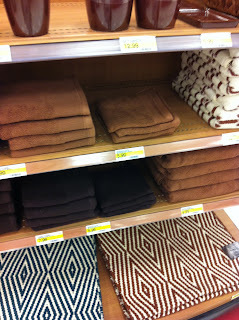 The towels, rugs and bedding are gorgeous colors. 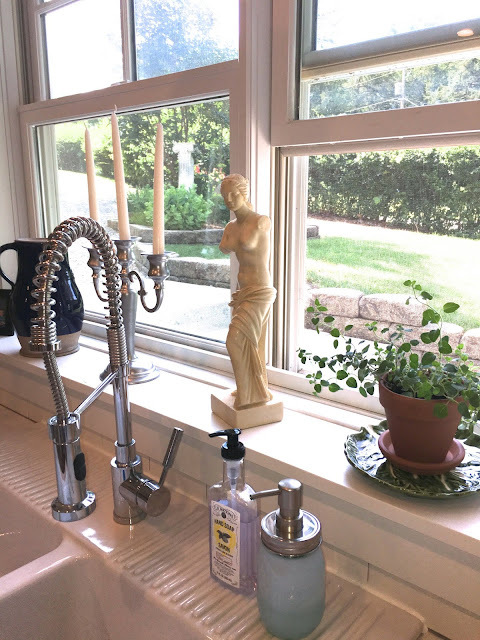 The soapstone bath accessories are also chic! The box I bought at home. Love it in a lot of spaces. Not sure where it will end up.. Some more of the treasures. Average price is about $19.99! 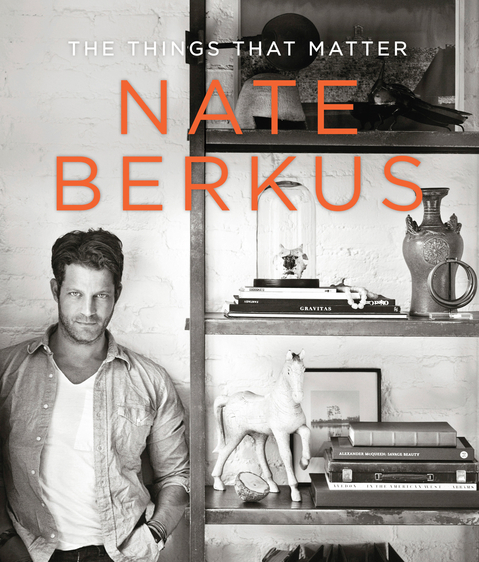 I also scored his inspiring book, “The Things That Matter.” It’s about $24 at Target vs. $35 in bookstores. The book sucked me in right away. Nate basically tells the story of his life up until now. Mementos from his life share space in his home and tell his story. He encourages us to do the same. 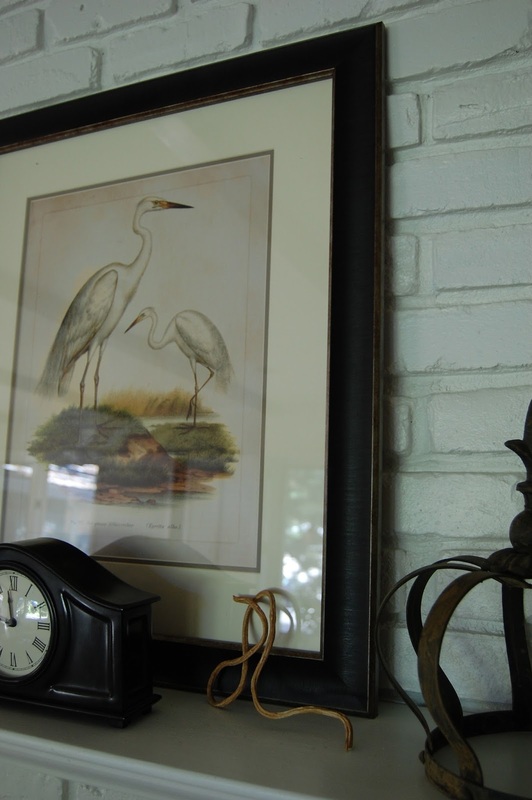 Things that mark special events, trips and that have significance should be part of your home. 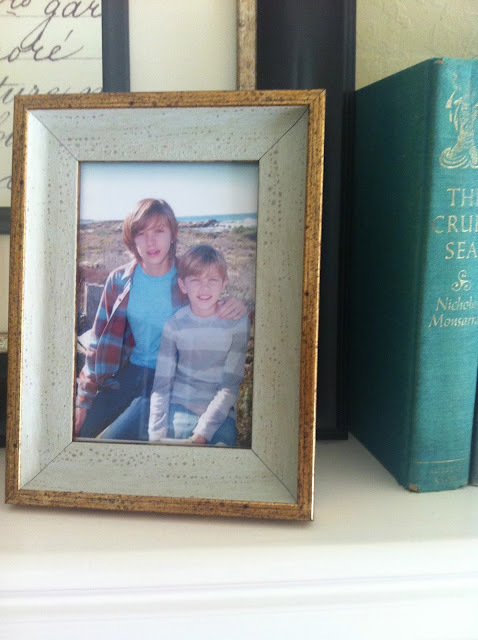 This book also shows some interesting people who live with their life’s treasures..
Could Nate be any more darling? Another reason I loved this book! He shows it’s those things and not expensive acquisitions that make a home have style and also make you want to be there. It’s your nest and not a showplace! 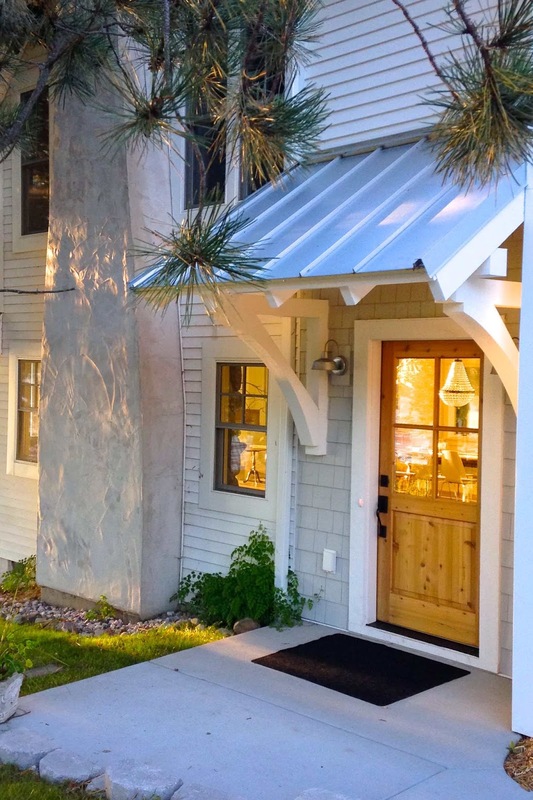 Remember that when you are feeling your home’s not living up to the model home standard. My next post I’ll show the things that matter to me, in my own home.